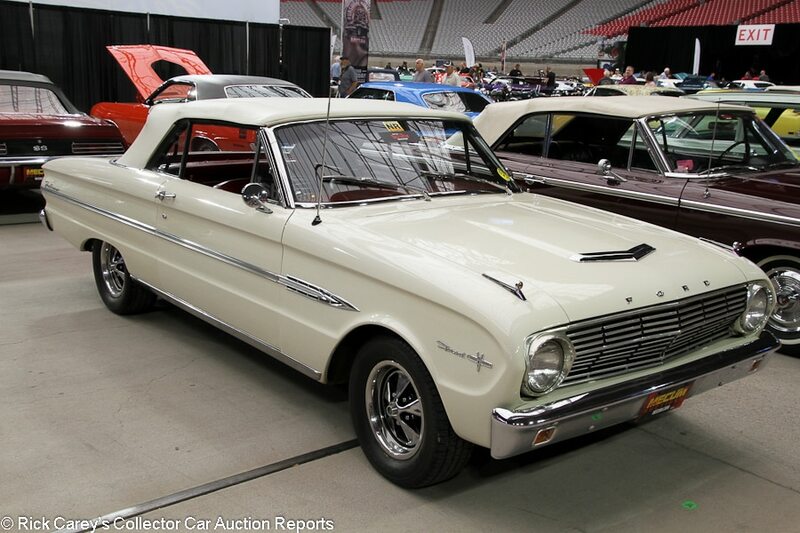 A new venue for Mecum Auctions, this was a two-day – no, a three-day – no, a four-day sale at State Farm (formerly University of Phoenix) Stadium in the west Phoenix city of Glendale, Arizona. 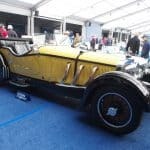 The expansion from two to four days was driven by the amount of consignor interest just two months after the annual Scottsdale collector car auction convention. Ultimately 1,258 vehicle lots crossed the block in a typically Mecum consignment, heavy in moderately-priced mainstream collector cars with a smattering of motorcycles, a few high-end showpieces and a fair number of late models: 84 were listed as built in the last ten years, 6.7% of the full docket. One lot, 1970 Dodge Challenger R/T Hemi Convertible, sold for a healthy $1,430,000 price. 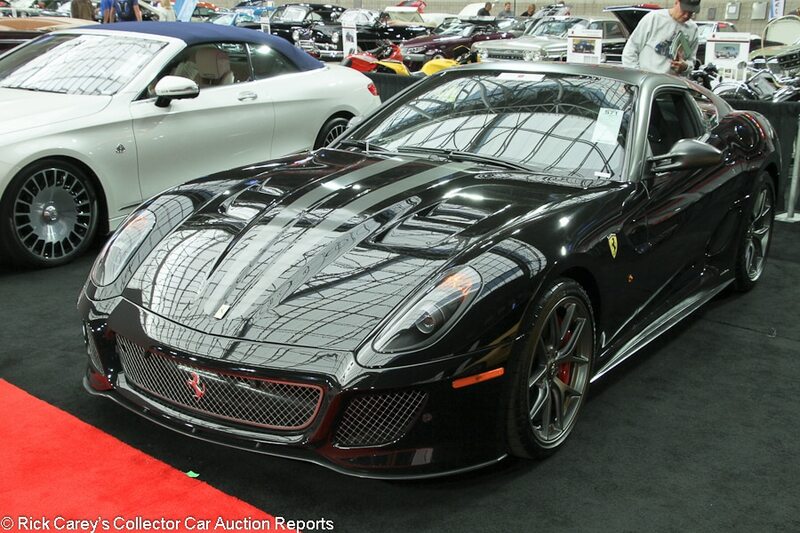 It and the 2011 Ferrari 599 GTO which sold for $770,000 are reported here. The other heavy hitter, 1932 Duesenberg Model J Torpedo Berline with chassis number 2574 and engine J-546 that sold for $880,000, is not reported but is familiar, having extensive auction history and sold at Hershey in 2007 for $945,000 and at RM Meadow Brook in 2010 for $726,000. Mecum’s first Phoenix auction is an impressive accomplishment and an important addition to Mecum’s already comprehensive auction calendar. Andrew Newton attended. I did the final edits and am ultimately responsible for the content. The report that follows is sorted by Marque and Model. 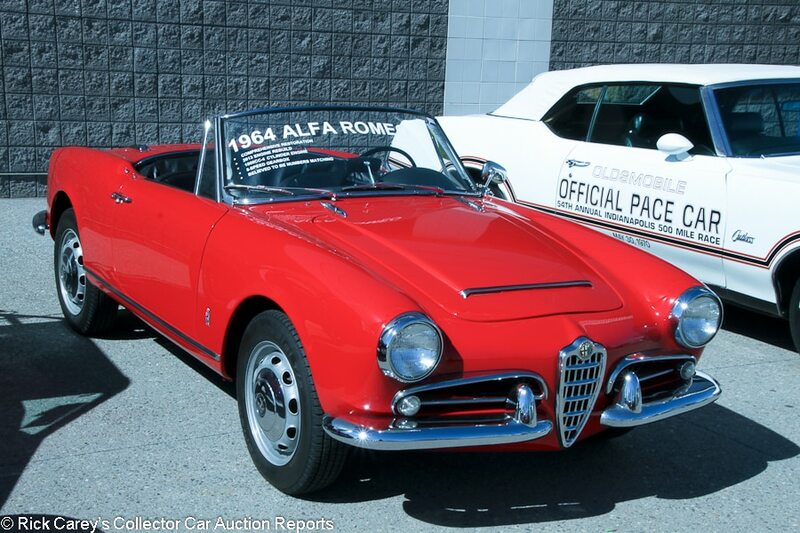 Lot # S22.1 1964 Alfa Romeo Giulia Spider; S/N AR375773; Red/Black; Black top; Older restoration, 3+ condition; With Reserve; Hammered Sold at $57,250 plus commission of 10.00%; Final Price $62,975 – 1570/105hp single carburetor, 5-speed, steel wheels with hub caps, tonneau cover. – Engine rebuilt in 2013 and it’s lightly used but tidy and correct. Good but not show quality older paint and chrome. Good newer seats and carpets, but the original gauges are cloudy and yellowed. Older-looking exhaust, but the underbody is tidy. A neat, inherently desirable little car, restored a while ago and enjoyed quite a bit since. 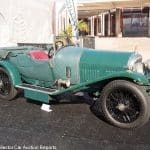 – A surprisingly strong result for the one and only Alfa in the auction considering the age of its restoration and lack of history, but perhaps it is the fact it is the one and only that concentrated bidders’ attention on it. This result is slightly favorable to the seller, but the new owner has a lovable little car and both parties can be happy with this transaction. 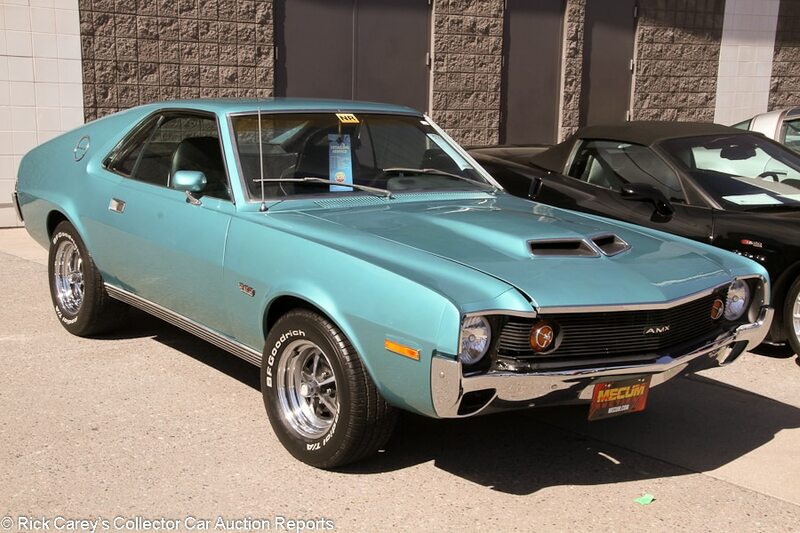 Lot # S14 1968 American Motors AMX Fastback; S/N CA954133; Alamosa Aqua/Black vinyl; Visually maintained, largely original, 3- condition; With Reserve; Not sold at Hammer bid of $22,000 – 390/315hp, 4-speed, Radial T/A tires, power steering, woodrim steering wheel, Hurst T-handle shifter, later Pioneer stereo. – Cheap respray with numerous runs and painted over chips. Part of the rear window frame is missing. Badges are missing off the nose and trunk lid, with just holes in their place. Cracked taillight lenses. Pitted rear brightwork. Lightly scratched window glass. Loose mirror. Decent original interior in condition that matches the outside. Thick old undercoating underneath. AMXs are cool, and this one has the big engine and a 4-speed, But it’s rough around the edges and needs weeks, if not months, of attention. – The reported high bid was a modest offer, but it was on a mediocre car. And mediocre cars, particularly ones with hard to find parts like an AMC, aren’t easy to sell. It should have changed hands at this number. 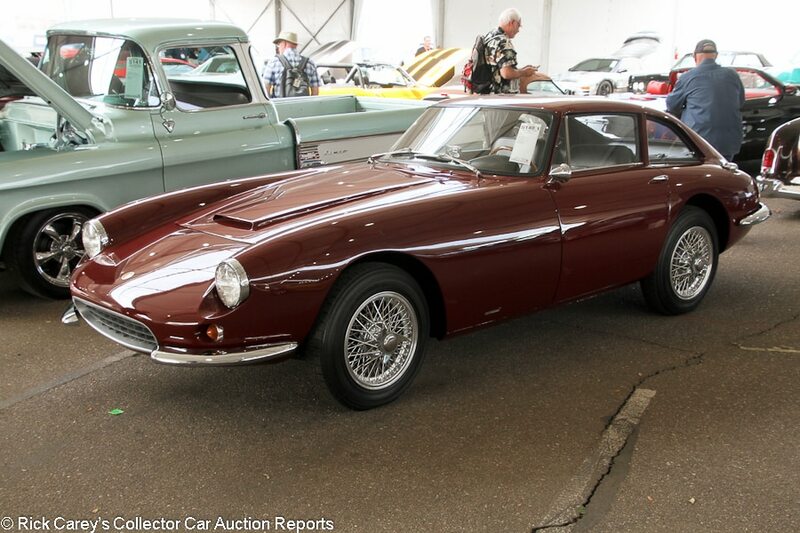 Lot # S140.1 1963 Apollo 3500GT Coupe; S/N 1004; Maroon/Black leather; Older restoration, 2- condition; With Reserve; Not sold at Hammer bid of $130,000 – Buick 215/200hp V-8, 4-speed, Borrani wire wheels, Michelin X tires, woodrim steering wheel, Jaeger gauges. – Restored but not overly detailed engine bay. The headlight bezels don’t fit straight. Good paint and chrome other than a small scratch on the right front fender and light orange peel on the B-pillars. The leather fits loosely on the seats, but the interior is mostly good. The Apollo looks and nearly goes like a Ferrari for a fraction of the price. This one wasn’t restored to Ferrari standards, though, because it isn’t a Ferrari, and these cars weren’t built to Ferrari standards in the first place. – RM Sotheby’s offered this car in Arizona only a couple of months ago, and it sold for a very strong $134,400 ($120,000 hammer), so there’s no reason to have refused the reported high bid here. It’s not like the Apollo coupe market has suddenly erupted in a fit of chic. 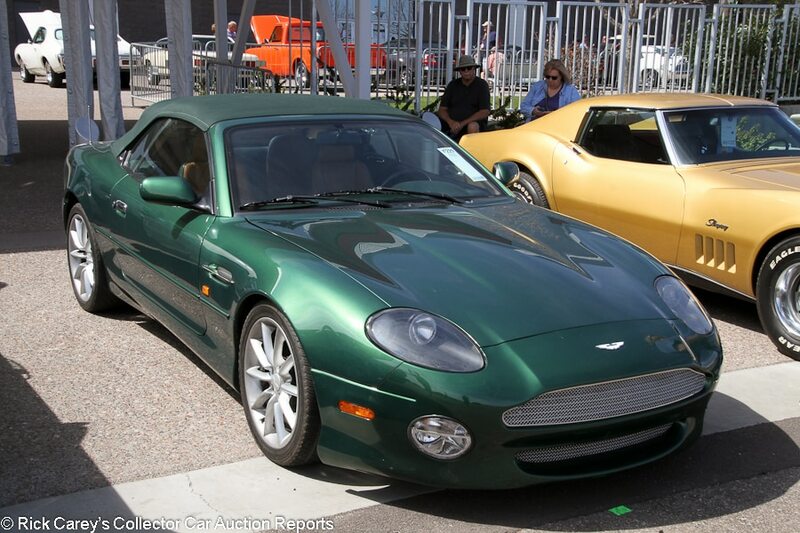 Lot # F229 2001 Aston Martin DB7 Vantage Convertible; S/N SCFAB42391K401275; Green/Tan leather; Green cloth top; Unrestored original, 3- condition; With Reserve; Not sold at Hammer bid of $25,000 – Alpine stereo, Bridgestone tires on the back and Continentals on the front. – Great colors, but a rough DB7. The paint is mostly good, but there are some light scratches, and the headlight lenses are cloudy and scratched. The top is worn and dirty, and there are two small rips on the right side. Light curb rash on the wheels. Dirty engine bay. Cracks in the wood dash, although the upholstery looks good. Mismatched tires and way too many problems for an Aston. And that’s just the looks. If nobody bothered to look after this car cosmetically, they probably didn’t keep up with it mechanically, either (and the mismatched tires are a good indicator of such neglect), and that’s when temptingly low-priced used Astons get expensive. – This DB7 has accumulated a lot of wear and tear since 2006, when it was a mildly depreciated late model exotic and sold for $81,000 at Barrett-Jackson West Palm Beach. It also reportedly hammered not sold at a $35,000 high bid at Mecum Monterey in 2015. It hasn’t gotten any better in the past 4 years and the reported high bid here is all the owner can realistically hope for. Aston owners typically take very good care of their cars. That means the standards are high, and gives this one the unfortunate distinction of being one of the worst. 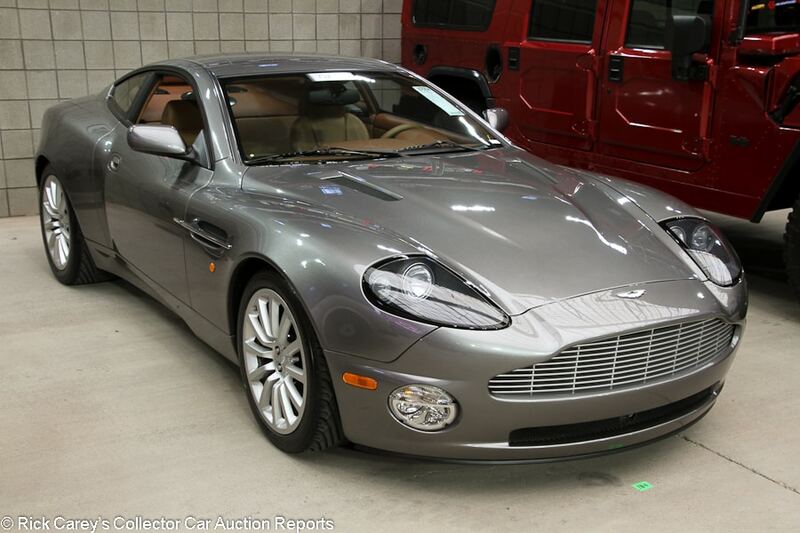 Lot # S184 2003 Aston Martin Vanquish Coupe; S/N SCFAC23353B501099; Tungsten Silver Metallic/Tan leather; Unrestored original, 2 condition; With Reserve; Hammered Sold at $79,000 plus commission of 10.00%; Final Price $86,900 – Yokohama tires, parking sensors, paddle shift. – 5,900-mile one-owner car. Looks nearly new and gorgeous. – Pretty far removed from its original price of nearly a quarter-million dollars, this is nevertheless a fair price for a 2003 Vanquish at the moment. 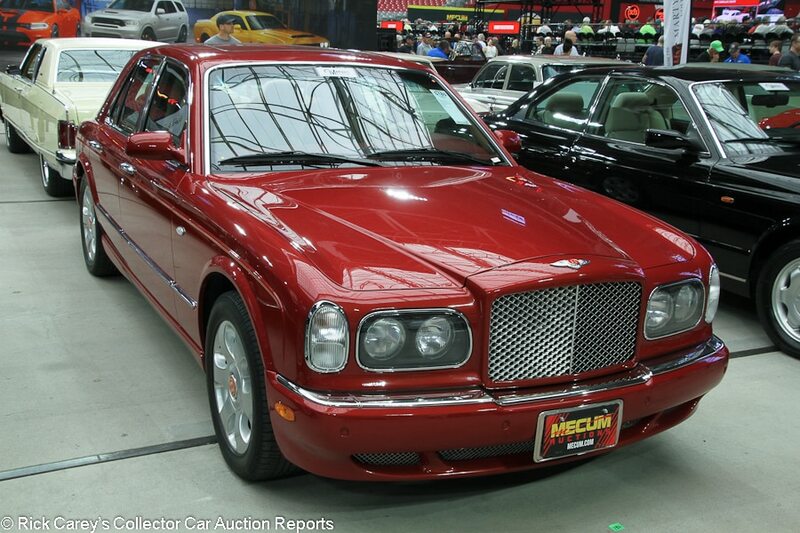 Lot # S180 2001 Bentley Arnage Red Label 4-Dr. Sedan; S/N SCBLC31E61CX05775; Fireglow/Beige leather piped in Red; Unrestored original, 2 condition; With Reserve; Not sold at Hammer bid of $40,000 – Red Label, special order paint, sunroof, navigation. – Just 7,637 miles and looks nearly showroom fresh aside from light wrinkling on the driver’s seat. – Still a stately, elegant, lavish car even after 20 years, this Arnage is still nevertheless a late-model Bentley and what it’s worth is a far cry from its original six-figure purchase price. The reported high bid wasn’t generous, but it wasn’t a lowball offer either and would be worth considering. 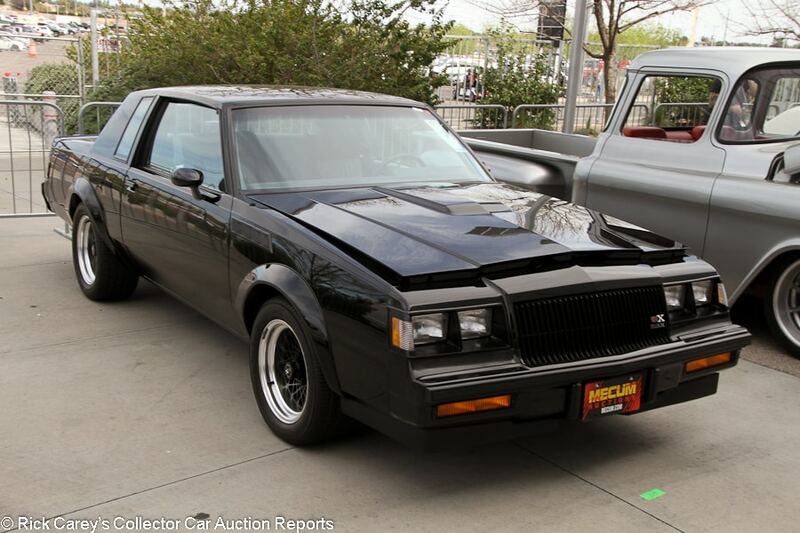 Lot # S310 1987 Buick Regal GNX Coupe; S/N 1G4GJ1172HP448610; Black/Gray, Black cloth; Unrestored original, 2 condition; With Reserve; Hammered Sold at $100,000 plus commission of 10.00%; Final Price $110,000 – Goodyear Eagle tires, climate control, cassette stereo. – Showing 1,581 miles. Car 265 of 547 built. Carefully stored and showing no serious wear, as it shouldn’t given the mileage. – Lots of GNXs are low-mile time-warps, though, so this one isn’t as special as one might think. It sold for $104,500 at Barrett-Jackson Scottsdale this year and has only done 17 miles since January. It sold for $117,700 at Scottsdale in 2017, too, and it’s hard to argue with consistency like that. 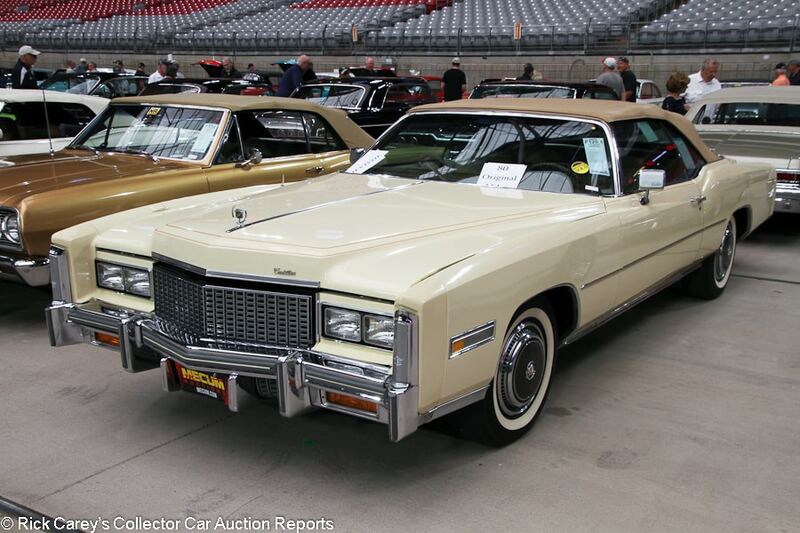 Lot # F120.1 1976 Cadillac Eldorado Convertible; S/N 6L67S6Q204929; Cream/Tan leather; Tan vinyl top; Unrestored original, 2 condition; With Reserve; Hammered Sold at $43,500 plus commission of 10.00%; Final Price $47,850 – Wheel covers, narrow whitewalls, original window sticker. – Showing 79 miles. The paint is lightly swirled but the top, interior and underbody are like new and the car was clearly stored carefully. – On the belief that this would be the last American convertible, plenty of people scooped these cars up and stored them away as investments. They were wrong of course, but there are still plenty of low-mile `76s around out there, so this car isn’t as special as one might think. Nevertheless, it’s worth more than most and it has several top-dollar auction results to prove it. It sold for $46,750 at Leake OKC in 2016 and for $51,700 at Mecum Monterey a few months later, both reasonably close to and consistent with the price here in Glendale. 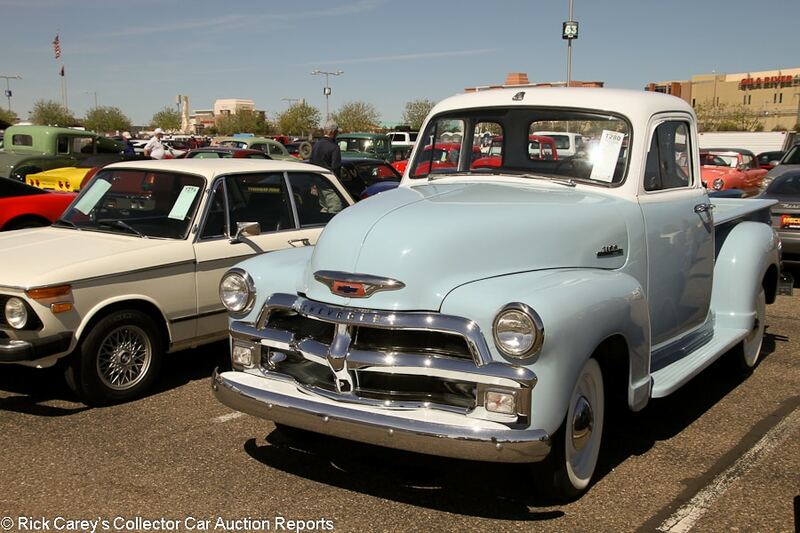 Lot # T280 1954 Chevrolet 3100 Pickup; S/N 4131402489; Light Blue, White roof/Brown vinyl; Truck restoration, 3+ condition; No Reserve; Hammered Sold at $22,000 plus commission of 10.00%; Final Price $24,200 – 235/115hp six, 3-speed, hub caps, whitewalls, column shift, wood bed floor. – Mostly good and shiny paint, but there is one touch up on the nose as well as some light scrapes around the passenger’s window. The rubber in the doors is cracked and the wood pieces in the bed are dry and aged. Erratic panel fit. Partially restored underneath with old undercoating on the frame and newer exhaust. Good newer seats. Done on a budget and there’s plenty to nitpick, but a good 20-footer in attractive colors. – A working truck with a workmanlike truck-appropriate redo, it wasn’t much to get excited about and brought a realistic price for its equipment and presentation. 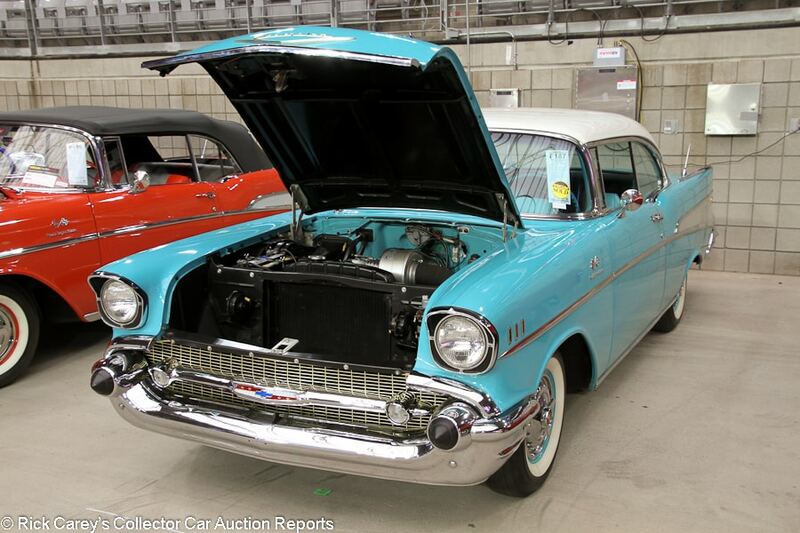 Lot # F187 1957 Chevrolet Bel Air FI 2-Dr. Sedan; S/N VC570128320; Tropical Turquoise, White roof/Turquoise vinyl, Black cloth; Visually maintained, largely original, 3+ condition; No Reserve; Hammered Sold at $45,000 plus commission of 10.00%; Final Price $49,500 – Spinner wheel covers, whitewalls, factory 283/250hp Fuelie, Powerglide, dash clock, original radio, dual antenna. – Unrestored but very clean and correct engine bay. Original but good and shiny chrome and brightwork. Crazing on the roof, but the Turquoise parts of the older repaint look good. Very good original upholstery other than some light discoloration. Good dash and instruments apart from some paint chipping off the steering wheel. Original other than a repaint, well-kept and desirably equipped. – A strong price for an imperfect car, but even Fuelie-powered Bel Airs are rarely this well preserved and this one got little if any premium for its originality and preservation. It is a rare find, and a good value at this result. Lot # S103 1969 Chevrolet Camaro SS Sport Coupe; S/N 124379N701850; Hugger Orange, Black accent/Black vinyl with houndstooth cloth inserts; Recent restoration, 2+ condition; With Reserve; Hammered Sold at $62,000 plus commission of 10.00%; Final Price $68,200 – 396/350hp L34, 4-speed, Rally wheels, Wide Oval tires, rear spoiler, cowl induction hood, Hurst shifter, factory radio, 12-bolt rear, 3.36 Positraction, power steering, power brakes. – Excellent paint and chrome. Factory gaps. Spotless underneath. Very good redone interior. A fresh, gorgeous, well-equipped SS with consistent attention to detail. It’s a very good car. – And, as it should have, it brought a very solid price. The desirable 4-speed, dramatic colors and excellent condition made for a high but not excessive result. 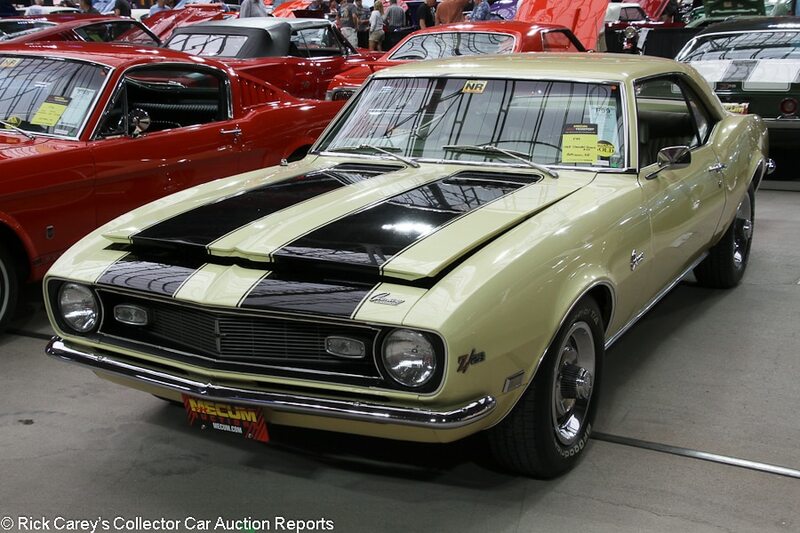 Lot # F99 1968 Chevrolet Camaro Z/28 2-Dr. Hardtop; S/N 124378N421989; Butternut Yellow, Black stripes/Gold vinyl; Visually maintained, largely original, 3+ condition; No Reserve; Hammered Sold at $43,000 plus commission of 10.00%; Final Price $47,300 – 302/290hp, 4-speed, Rally wheels, Radial T/A tires, power steering, power brakes, Hurst shifter, factory radio. – The paint is heavily crazed on the front and right rear fenders as well as cracked along the drip rails, but the hood looks repainted. Lightly worn, possibly original seats. Serious cracks on the dash top. Unrestored underneath, but maintained with newer exhaust, fasteners and suspension pieces. A rare `68 Z/28 in good colors and mostly original, but it has issues. – This car sold for $38,500 a Russo Scottsdale in 2009, and was presumably in similarly mediocre condition then as it is now. Both are appropriate numbers in their time for an inconsistently presented second-year Z/28 without any history to speak of. 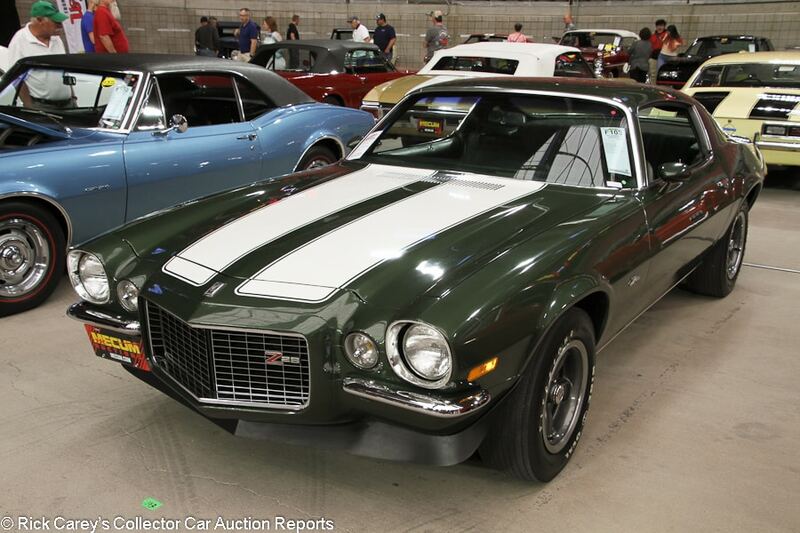 Lot # F103 1970 Chevrolet Camaro Z/28 Sport Coupe; S/N 124870L532634; Forest Green, White stripes/Green vinyl; Enthusiast restoration, 3+ condition; With Reserve; Hammered Sold at $45,000 plus commission of 10.00%; Final Price $49,500 – 350/360hp, 4-speed, spoilers, 12-bolt rear, power steering, power brakes, Hurst shifter, factory radio, forged crank, aluminum intake. – The paint looks great from a distance, but there were masking errors around the stripes and there is inconsistent orange peel. Lightly scratched rear glass. Dry weather stripping. Good interior that seems mostly original. Unrestored but tidy and maintained underneath. A well-equipped and reasonably well kept LT1-powered Z/28, but not seriously restored and far from perfect. – Good equipment and colors, but fairly discounted for its numerous issues and not worth much more than this even in concours condition. Chevy built 8,738 Z/28’s in 1970; they’re not exactly rare, just fun to drive. 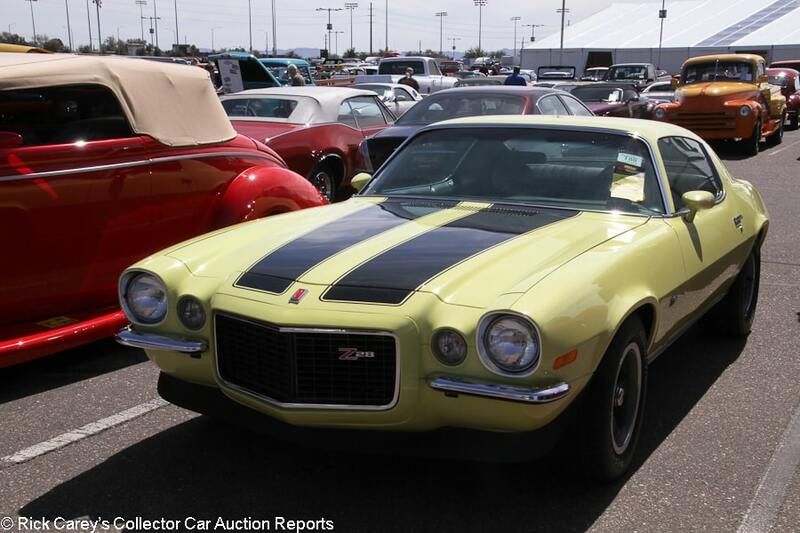 Lot # T80 1973 Chevrolet Camaro Z/28 RS Sport Coupe; S/N 1S87T3N174780; Light Yellow, Black stripes/Black vinyl; Enthusiast restoration, 2- condition; With Reserve; Hammered Sold at $31,500 plus commission of 10.00%; Final Price $34,650 – 350/245hp, 4-speed, Radial T/A tires, spoilers, Hurst shifter, modern Kenwood stereo, headers, factory air conditioning (currently removed but included with sale). – Rebuilt matching numbers engine. The body piece around the grille doesn’t fit straight. Good repaint. Factory gaps. The gauges are a little dull but the interior is mostly good. Fully restored underneath. One of the later Z/28s with more show than go, but it’s got all the right stuff and was restored to reasonably high standards. – For 1973, the Camaro dropped the SS option. The Z/28 was the only place to turn for performance, although the engine was now down to 245hp, and the new LT package offered interior upgrades, Rally wheels and sport mirrors. This is a quite good if flawed example, and it brought a fair price. 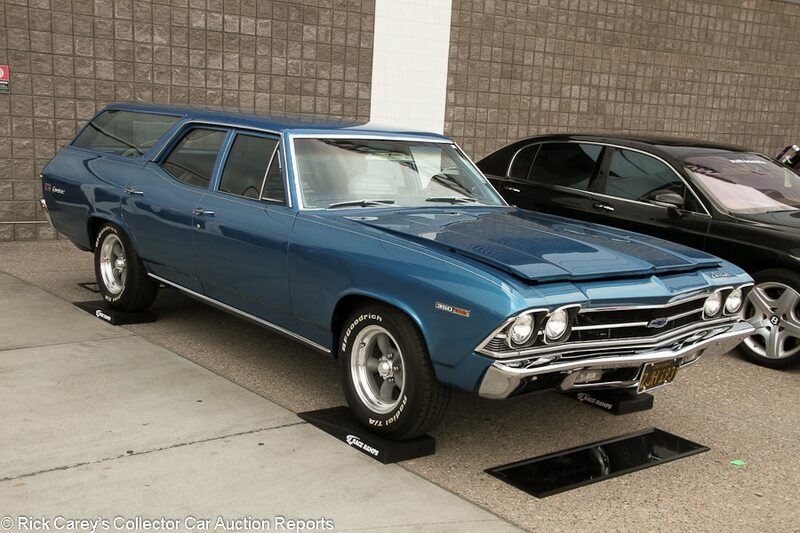 Lot # S20 1969 Chevrolet Chevelle Greenbrier Station Wagon; S/N 134369Z350547; LeMans Blue/Blue vinyl; Recent restoration, 2- condition; With Reserve; Not sold at Hammer bid of $30,000 – Matching numbers 350/300hp engine, Hydramatic, American Racing wheels, Radial T/A tires, column shift, power steering, power front disc brakes, dual action tailgate, sport steering wheel, Vintage air conditioning, tach, later radio, tinted glass. – An awesome 350-powered Chevelle wagon in its attractive original colors. Very good paint and chrome other than two small scrapes and a chip on the driver’s door. Nearly spotless fully redone engine bay and underbody. Some lightly worn switchgear and some discoloration on the seats but mostly very good interior. Very rare equipment, restored to essentially like new standards and then lightly enjoyed since. – Greenbrier is the deluxe trim level, largely comparable with the Malibu, and the restoration of this one takes full advantage of its distinction. Most wagons of this period, and there were a lot of them, lived hard lives of family hauling duty so even though Chevy built over 48,000 Chevelle wagons in 1969 not many survive and still fewer are in such carefully restored and lightly used condition. The reported high bid is not unduly conservative, but the consignor is similarly justified in holding out for more. 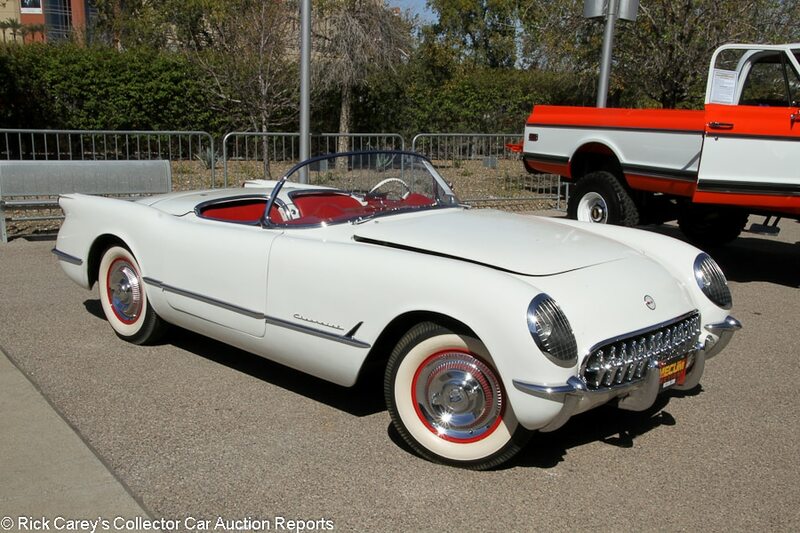 Lot # F110 1958 Chevrolet Corvette Convertible; S/N J58S105669; Panama Yellow, White coves/Charcoal; Older restoration, 3 condition; With Reserve; Hammered Sold at $70,000 plus commission of 10.00%; Final Price $77,000 – Spinner wheel covers, whitewalls, hardtop, replacement dual quad 283/270hp engine, 4-speed, tinted windshield, radio and heater delete. – The hardtop looks original with rough trim and scratches on the generally cloudy rear window. Good older restored interior. Paint prep issues on the coves. A few small cracks around the hood and microblisters in several spots. Older restored underneath. You wouldn’t be ashamed of this car, but you wouldn’t put it in a show, either. A paint job would make a huge difference, but with the replacement engine and lightly aged condition it’s best used as a casual driver. – This car last sold at Barrett-Jackson Scottsdale in 2012 for an over-the-top $82,500. Today’s result is still generous considering the aged condition and replacement engine. 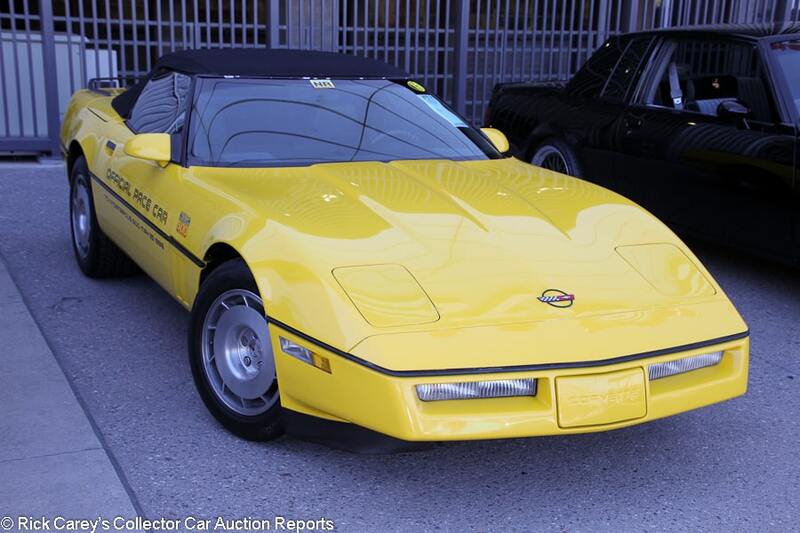 Lot # F3.1 1986 Chevrolet Corvette Convertible Pace Car; S/N 1G1YY6781G5904827; Yellow, Pace Car graphics/Black leather; Black top; Unrestored original, 3- condition; No Reserve; Hammered Sold at $5,000 plus commission of 10.00%; Final Price $5,500 – 350/230hp, automatic, luggage rack, power everything. – Mileage not represented but this is not a mothballed time warp car like some ’86 Pace Car convertibles out there. The front bumper is severely cracked and there are numerous chips throughout. There are also some chips in the Pace Car decals, and the Indy 500 decals on the front fenders are faded. Worn seats, with a rip in the driver’s side outer bolster. A pretty rough driver, although an `86 convertible with an auto isn’t that much fun to drive anyway. – Not much money at all for a V-8 convertible sports car, but given this one’s presentation it’s hard to argue it deserved much more than the price it brought. It competes with carefully preserved Pace Car convertibles and the dropoff from low miles-pristine is precipitous. Maybe not this precipitous, but it was early on Friday when this Pace Car crossed the block and the audience may not have been awake yet. 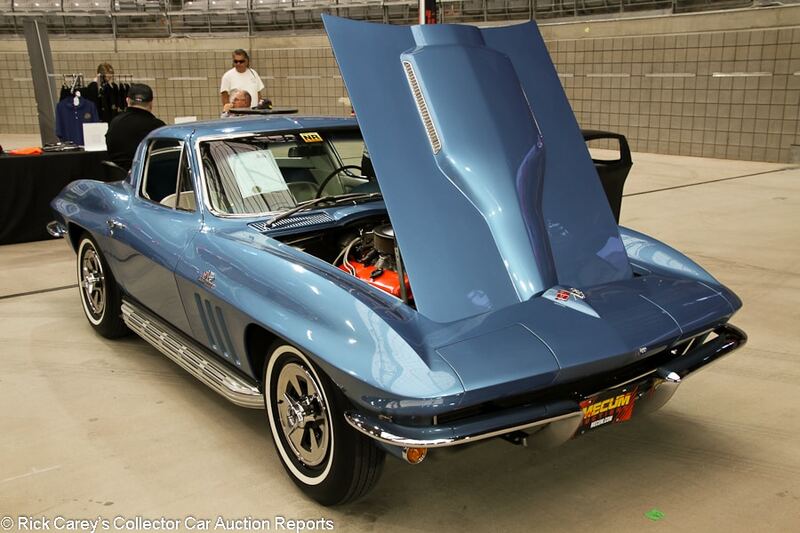 Lot # S119 1965 Chevrolet Corvette Coupe; S/N 194375S119758; Nassau Blue/White vinyl; Older restoration, 2- condition; No Reserve; Hammered Sold at $69,000 plus commission of 10.00%; Final Price $75,900 – 396/425hp L78, 4-speed, spinner wheel covers, narrow whitewalls, side exhaust, aluminum radiator, woodrim steering wheel. – Represented as matching numbers for the first year Corvette big-block. Good fully restored engine bay. Older repaint that looks very good at first glance, but there were some prep issues and particles are embedded in the front fender paint. Lightly scratched rear glass and cracked rear badge. Uneven gaps. Very good, mostly restored interior other than some scratches next to the shifter. Attractive colors, inherently desirable and well equipped, but the restoration missed on some important details. – Issues aside, this is a weak price for a matching numbers L78 coupe with a 4-speed and side exhaust, but it also just sold for $77,000 at Mecum Kissimmee two months ago, giving the consignor a thorough bath for just two months’ ownership. 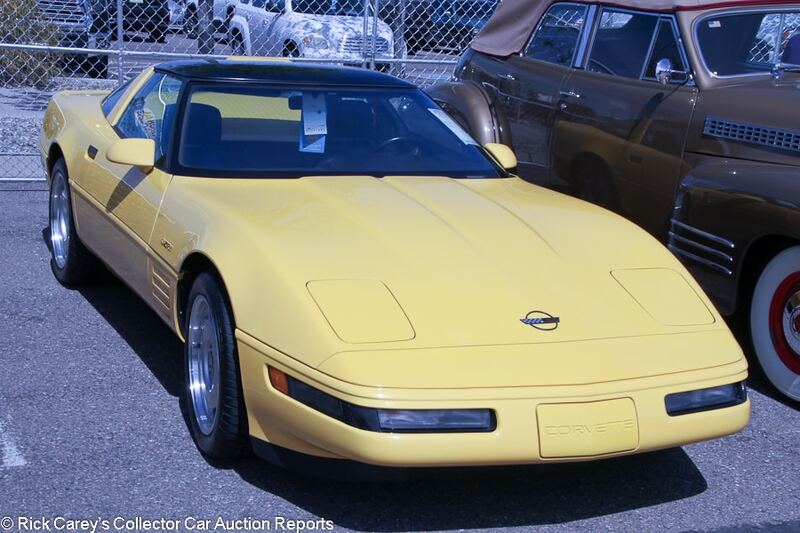 Lot # F270 1992 Chevrolet Corvette ZR-1 Coupe; S/N 1G1YZ23J3N5800240; Competition Yellow, Glass roof/Black leather; Unrestored original, 2- condition; With Reserve; Not sold at Hammer bid of $20,000 – 350/375hp ZR-1, 6-speed, saw blade wheels, Sumitumo tires, CD stereo, both glass and body color roof. – Some age on the wheels, and the plastic bottom front lip is scraped up, which is inevitable if you drive a C4 on anything other than a perfectly flat surface. Very good paint and lightly worn interior. Tidy with light road wear underneath. Lightly used and mostly good if not perfect, showing 38,220 miles. – Competition Yellow is among the rarest and most desirable C4 colors, especially on ZR-1s. This one is represented as one of 28, and its mileage isn’t low but it isn’t remarkably high, either. Regardless, it failed to seduce anybody and the seller was well within reason to hold out at the low reported high bid. Lot # S179 2010 Chevrolet Corvette ZR-1 Coupe; S/N 1G1YN2DT1A5800131; Cyber Gray Metallic/Black, Gray leather; Unrestored original, 2 condition; With Reserve; Not sold at Hammer bid of $65,000 – 3ZR Package, chromed wheels, Pilot Sport tires, carbon fiber roof. – Other than inevitable light wrinkling on the driver’s seat, it’s nearly like new and represented with 4,268 miles. High performance C6s are still more used car than collectible, but they’re bound to appreciate eventually and this is already a collector-grade example. 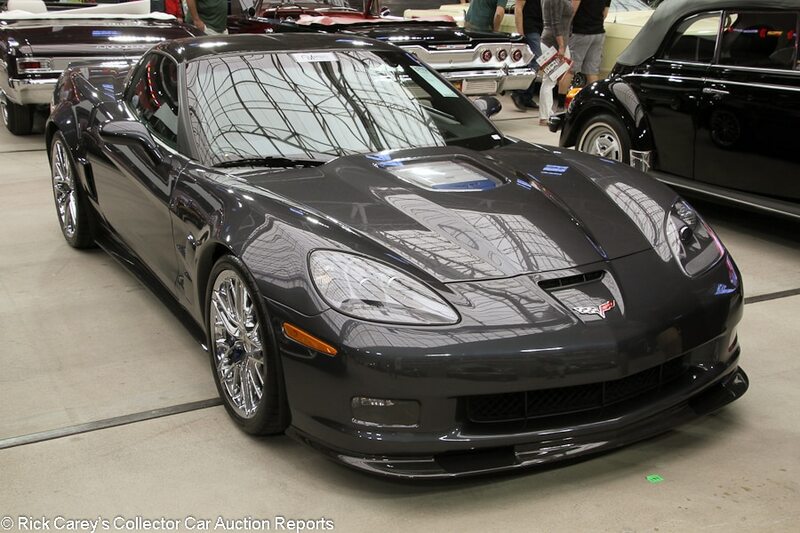 – C6 ZR1s represent an incredible performance-per-dollar value at their current prices, but for a car with such low mileage, the reported high bid here was on the light side and turning it down was understandable. Lot # F175 1960 Chevrolet Impala Sport Coupe; S/N 01837L209927; Ermine White/Red, White vinyl with houndstooth cloth inserts; Unrestored original, 3+ condition; No Reserve; Hammered Sold at $35,000 plus commission of 10.00%; Final Price $38,500 – Tri-Power 348/280hp, 4-speed, wheel covers, whitewalls, dual mirrors, bench seat, factory radio, tinted windshield, rear seat speaker. – Dull and lightly scratched but presentable original chrome. Remarkably good original paint. You have to get up close to see the general fading and few small touch ups. Phenomenally well preserved original interior. The exhaust looks pretty rough, but otherwise the car looks very tidy underneath. Desirable equipment, good colors and totally unrestored. A strong Impala. – This is a good, sound, attractive, well-optioned original Impala that brought in effect no originality premium at all. Even though the result was at the pre-sale low estimate it could have brought $10,000 more for originality alone and not been unreasonably expensive. A good value. 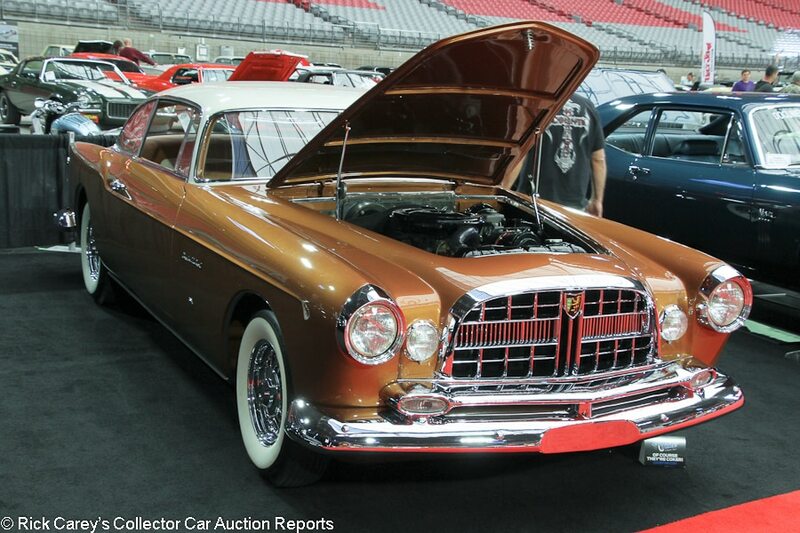 Lot # S135.1 1955 Chrysler Ghia ST Special Hardtop Newport, Body by Ghia; S/N N558768; Copper, Ivory roof/Copper, Ivory leather; Concours restoration, 1- condition; With Reserve; Not sold at Hammer bid of $450,000 – 331/250hp Hemi, automatic, wire wheels, whitewalls, power steering, power brakes, Town and Country radio, power windows. – The last collaboration between Virgil Exner and Ghia. One of four built. Exhibited at the Turin Motor Show in 1955. Restored in 2014. Tiny but serious chip in the right side of the windshield and very light wrinkling on the driver’s seat, other than that, the paint, chrome, interior and engine bay are excellent. A significant, gorgeous and rare Italo-American hybrid. 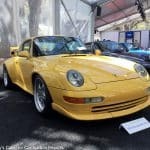 – This important, gorgeous car sold for $527,500 at RM Sotheby’s Monterey a few months ago, so refusing the reported high bid here in Arizona was understandable although the decision to bring it back to the marketplace seven months after paying a retail price is questionable. 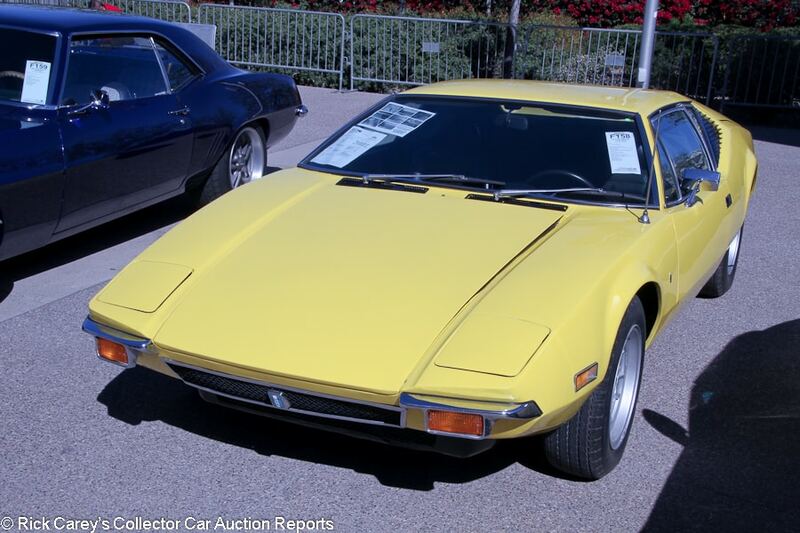 Lot # F158 1972 DeTomaso Pantera Coupe; S/N THPNMC03594; Yellow/Black vinyl; Visually maintained, largely original, 3+ condition; With Reserve; Not sold at Hammer bid of $50,000 – 351/330hp, 5-speed, Campagnolo wheels, Cinturato tires, Becker Europa radio, power windows, air conditioning. – Pitted left front bumperette. Tired older repaint that was probably never very good to begin with. There are a few masking errors plus several cracks, particularly along the drip rails and on the engine cover. The interior is all original and pretty well kept, although the gauges are a little faded. Tidy and original underneath. A mostly original and reasonably well kept Pre-L Pantera that hasn’t been modified. – This car was had for a steal at $53,900 in Kissimmee last year. It similarly got no love here in Arizona, though, and holding out at the reported high bid was a reasonable reaction even though the unsuccessful high bid was $1,000 more than its successful hammer bid at Kissimmee, which on the strength of this result may not have been a “steal” at all. 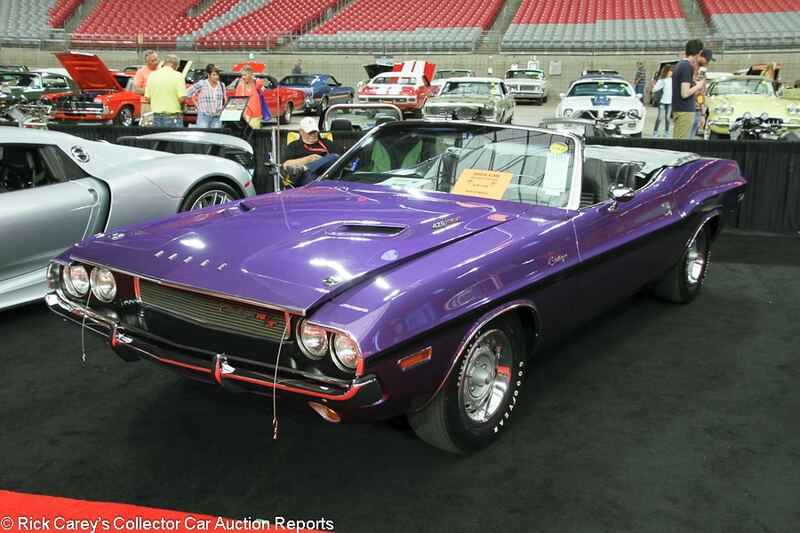 Lot # S101 1970 Dodge Challenger R/T Hemi Convertible; S/N JS27R0B171715; Plum Crazy, Black side stripes/Black vinyl; Black vinyl top; Older restoration, 2+ condition; With Reserve; Hammered Sold at $1,300,000 plus commission of 10.00%; Final Price $1,430,000 – 426/425hp Hemi, 4-Speed, 4.10 Super Track Pack, power brakes, hood pins, Hurst pistol grip shifter, Rally gauges, console, factory radio. – One of five Hemi R/T Challenger 4-speed R/T convertibles built, restored for Milt Robson in the 1990s. Factory replacement block. Very good paint, chrome and interior. Fully restored, showing just 118 test miles, and still gorgeous despite the age of the restoration. – Not sold at a $675,000 high bid at Mecum Indy 9 years ago and not sold at a $1.32M hammer bid at Worldwide Scottsdale last year. The ‘Cuda/Challenger Hemi convertible legend began a few years ago, swelled to a crescendo, then petered out before recently coming alive again. This result may not stand the test of time, but it is what it takes today. 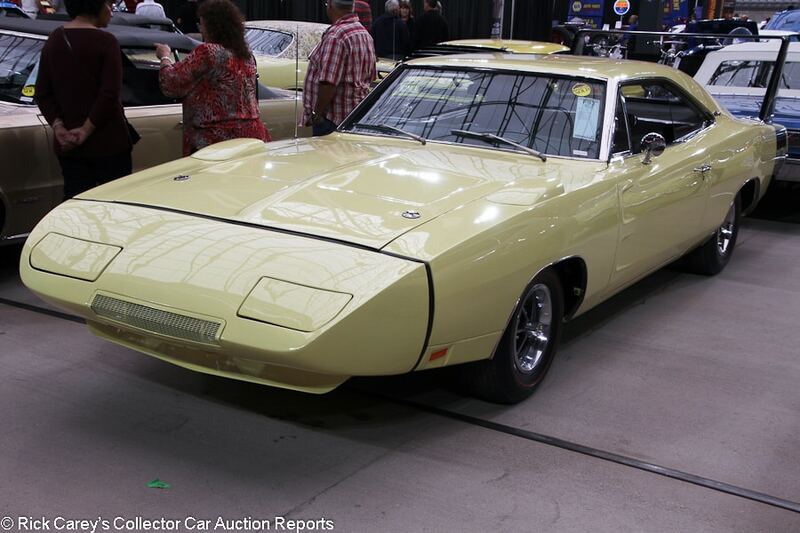 Lot # F93 1969 Dodge Charger Daytona 2-Dr. Hardtop; S/N XX29L9B409067; Yellow, Black tail stripe and wing/Black vinyl; Older restoration, 2- condition; With Reserve; Hammered Sold at $150,000 plus commission of 10.00%; Final Price $165,000 – 440/375hp Magnum, automatic, red line tires, floor shift, Tic-Toc-Tach, radio, power steering. – Very good older paint. Factory gaps. Lightly scratched rear glass. Lightly worn steering wheel and seats, but the interior is mostly good and restored. Very tidy underneath. Superbirds are rare, and Daytonas are even rarer. This one is a sound older restoration with very little to nitpick, but it is a little aged and the engine is a replacement. – This car sold for $107,000 at Mecum Indy in 2013, a light result considering the Daytona’s rarity compared to its Superbird counterpart but heavily burdened by the replacement engine. 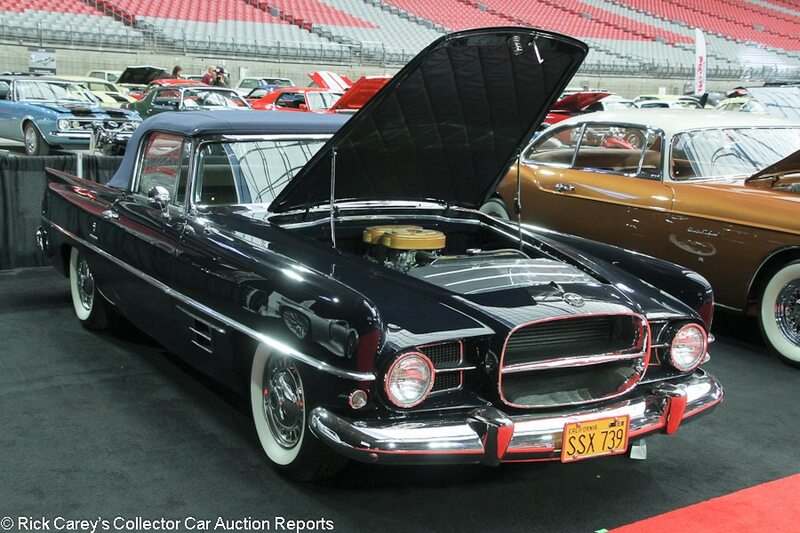 The bidders in Arizona were more taken with it and more willing to forgive the lack of matching numbers. This price is obviously much stronger but it still realistically handicaps the replacement engine in a car otherwise worth closer to $200 Large. 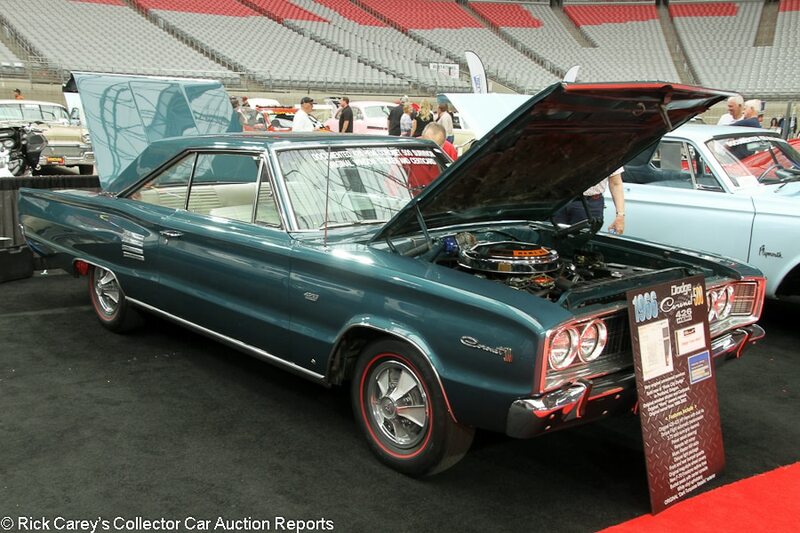 Lot # S159 1966 Dodge Coronet 500 Hemi 2-Dr. Hardtop; S/N WP23H61309750; Dark Turquoise Metallic/White vinyl; Unrestored original, 2- condition; With Reserve; Not sold at Hammer bid of $50,000 – 426/425hp Hemi, automatic, mag wheel covers, red line tires, 3.73 Sure Grip, power steering, remote mirror, bucket seats, floor shift, console, radio. – Big scratch on the left front fender. Large blister below the right A-pillar. Rub through on the roof and B-pillars in several spots. Chips at the back edges of the doors. The chrome and brightwork are also pretty tired but there are no major issues aside from general dullness. Clean and maintained but unrestored engine bay. Very good, lightly worn interior. All can be forgiven on this car since it’s an all-original genuine Hemi Coronet. It hasn’t been babied and mothballed, but it still looks great despite its age and is too good to restore. 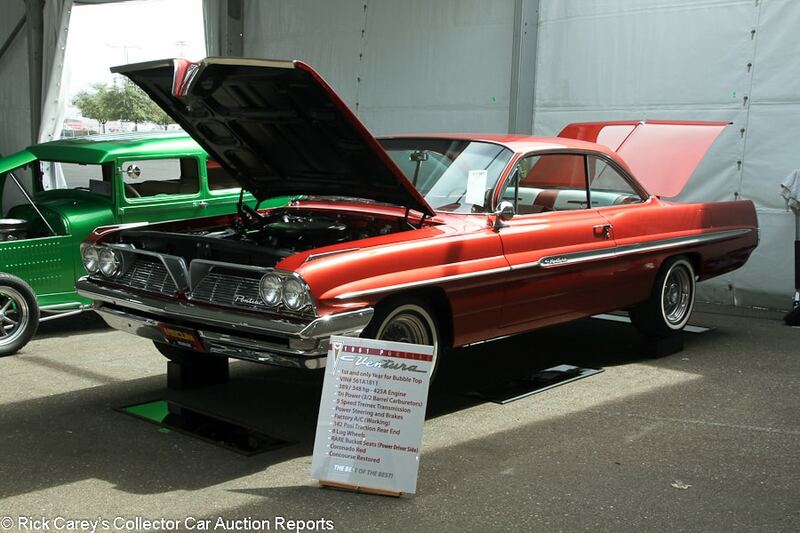 – No one appears to have being paying attention when this good Coronet 500 Hemi Hardtop crossed the block because the amount reportedly bid for it is irrelevantly low. 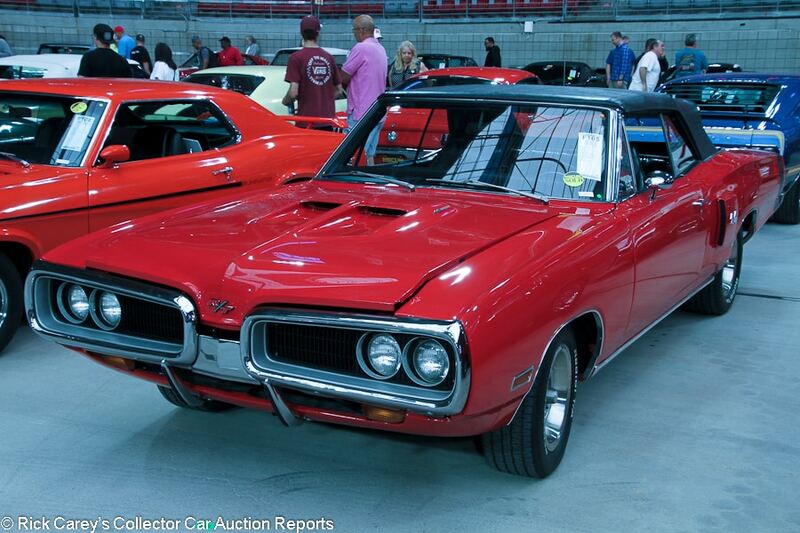 Lot # F105 1970 Dodge Coronet R/T Convertible; S/N WS27U0G120610; Bright Red, Black tail stripe/Black vinyl; Black vinyl top; Cosmetic restoration, 3+ condition; With Reserve; Hammered Sold at $40,000 plus commission of 10.00%; Final Price $44,000 – 440/375hp Magnum, automatic, Radial T/A tires, power steering, bucket seats, console, floor shift, factory radio. – Fairly tired chrome. Good older paint other than some orange peel on the right front fender. Even gaps, well preserved mostly original interior. Lightly restored but never taken fully apart. – This car previously sold for $42,000 at Mecum Indy in 2008 and at $44,000 at Russo and Steele Scottsdale the following year. It’s three identical results in over a decade, but although Coronets are worth more than they were 10 years ago, this one has also aged and been driven. This is a realistic price for it. 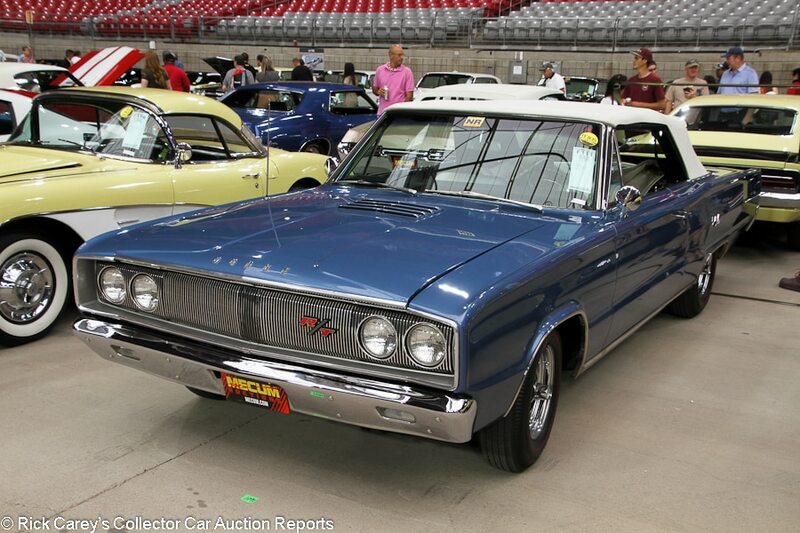 Lot # F111 1967 Dodge Coronet R/T Convertible; S/N WS27L77177284; Blue/White vinyl; White vinyl top; Enthusiast restoration, 3+ condition; No Reserve; Hammered Sold at $35,000 plus commission of 10.00%; Final Price $38,500 – 440/375hp Magnum, automatic, red line tires, power steering, boot cover, bucket seats, floor shift, console, factory radio. – Decent older paint and chrome with a small chip on the driver’s door as well as some microblisters and cloudy finish on the trunk lid. Scratched door handles. Good older replacement top other than a few smudges. Good interior that’s original other than the front seats. Restored and clean underneath. Redone to appropriate standards for what it is, but done on a budget and indifferently presented with some age and a few miles since the restoration. – The Glendale bidders clearly saw this Coronet for what it is and priced it appropriately for its weekend driver condition. The new owner got an apparently sound big block convertible for the upcoming driving season and an attractive entry-level collector car with some panache and visual appeal. 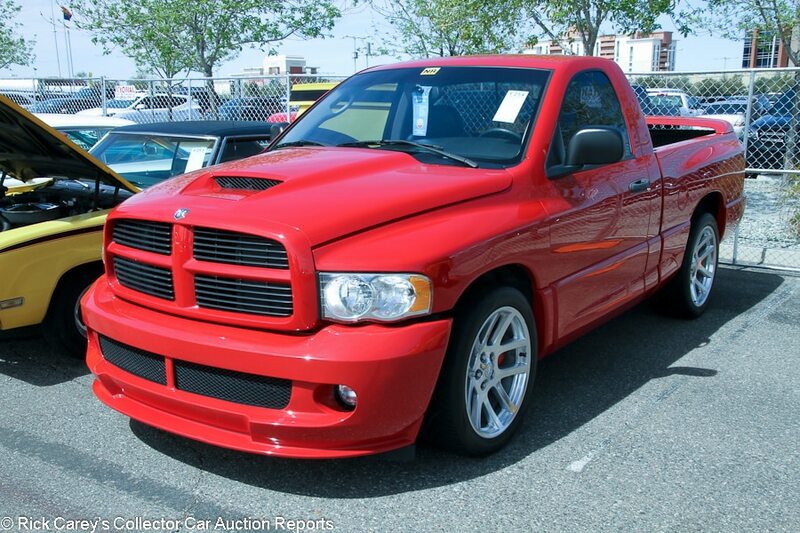 Lot # F254 2005 Dodge Ram SRT-10 Regular Cab Pickup; S/N 3D3HA16H15G731467; Red/Gray; Unrestored original, 3+ condition; No Reserve; Hammered Sold at $17,000 plus commission of 10.00%; Final Price $18,700 – 505/500 hp V10, 6-speed, alloy wheels, Nitto tires, red calipers, Hurst shifter, tinted glass, CD stereo, power windows, air conditioning. – Showing 61,277 miles. The paint and exterior plastic are a little tired. Several chips on the nose, hood and mirrors, and there’s a small scrape on the passenger’s side mirror. Clean bed, not that many people ever used these as a work truck anyway. Lightly worn seats but mostly good interior. Not abused but not babied either, just driven regularly and probably with the tires spinning much of the time. – With a monstrous Viper V-10 under the hood and a 6-speed manual, the Ram SRT-10 is a collectible model for pickup fans and Mopar enthusiasts, but the ones that bring top dollar are the low-mile near immaculate examples. This one is essentially just a used truck and it is reflected in the price, but at least the new owner has a ton of performance per dollar. 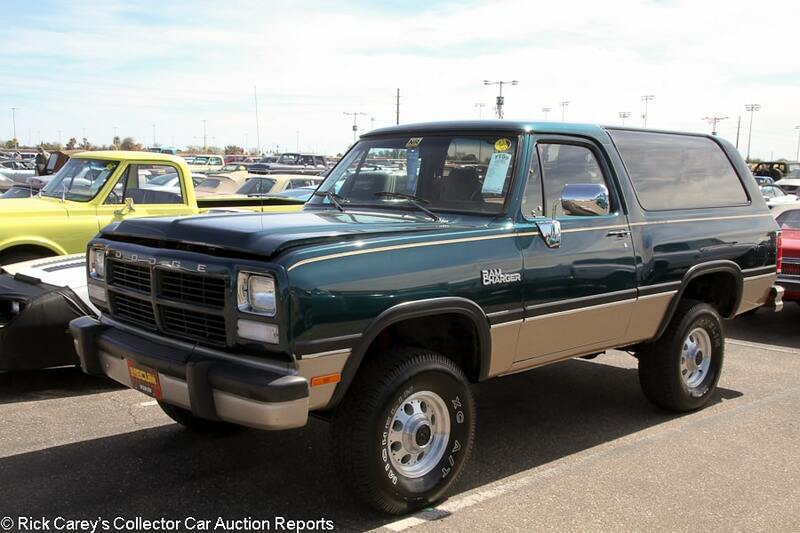 Lot # T199 1993 Dodge Ramcharger Canyon Sport SUV 4×4; S/N 3B4GM17Z6PM104705; Green, Gold/Tan vinyl, cloth; Unrestored original, 3+ condition; No Reserve; Hammered Sold at $15,000 plus commission of 10.00%; Final Price $16,500 – 360/230hp, automatic, Michelin tires, mild lift kit, power steering, power brakes, factory air conditioning, tilt steering column, power windows, bucket seats, console, column shift, four-wheel drive, factory cassette stereo. – Represented as a one owner Ramcharger. Showing 74,097 miles, but the Southwestern climate has been kind to it. The finish on the paint is bright and shiny, but there are light scratches and chips here and there. Lots of scratches on the rear bumper. Original underneath but pretty tidy. Very good interior with hardly any wear. It’s a used Ramcharger, but it has led an easier life than most and still looks pretty good. – With its huge side glass and crosshair grille, the second gen Ramcharger is more distinctive than the equivalent Blazer or Bronco, and luckily this one doesn’t seem to have been thrashed around off-road like many of these compact vintage 4x4s have and the factory A/C will be welcome when off-roading in the desert. This result recognized the undeniable age but still impressive level of preservation, and was fair to both parties. Lot # S109.1 1957 Dual-Ghia D/G Super D500 Convertible, Body by Ghia; S/N 150; Dark Blue/Blue, White leather; Dark Blue cloth top; Older restoration, 3 condition; With Reserve; Not sold at Hammer bid of $300,000 – 361/310hp Super D500 with dual quads, automatic, spinner wheel covers, whitewalls, limited-slip, power steering, later front disc brakes, Town and Country radio, bucket seats, floor shift. 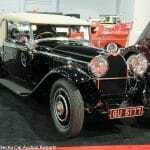 – Displayed in the Petersen Museum and used in the TV miniseries “Sinatra”. Very clean and restored but not overly detailed engine bay. Tired old paint. The top is lightly worn and the frame looks pretty rough. Lightly worn seats. Dual Ghias are extremely rare so it’s hard to be picky when shopping for one, but this is a pretty worn out older restoration that needs a round of serious freshening. – There’s a bit of confusion about the lump under the hood. If it’s a Super D500 it’s a 325/310hp Hemi with dual quads, not the 361 cid block itemized on the car card. That is, unless the original block has been swapped for something later or bored out. The reported high bid here should have been enough to see this conflicted and rather tired Dual-Ghia on its way off the block with someone signing the ticket for it. 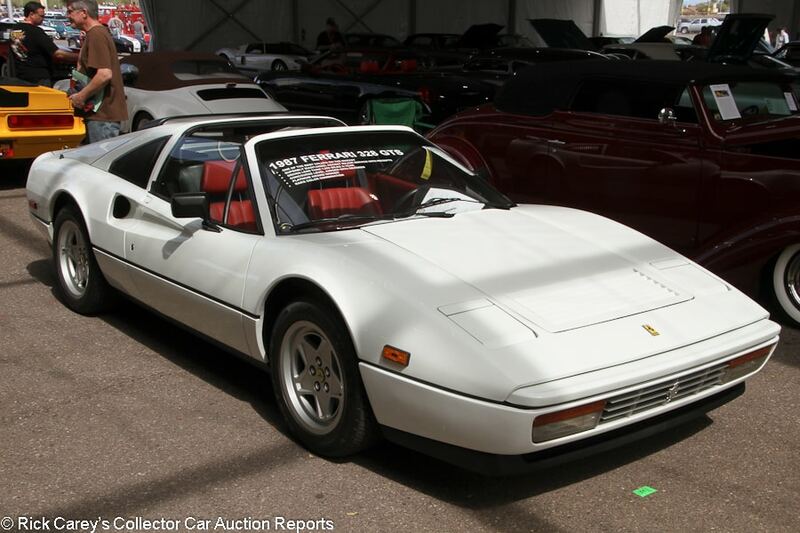 Lot # S158.1 1987 Ferrari 328 GTS Spider, Body by Pininfarina; S/N ZFFXAZ0A8H0070827; White/Red leather; Unrestored original, 2- condition; With Reserve; Hammered Sold at $79,000 plus commission of 10.00%; Final Price $86,900 – Kumho tires, later Alpine stereo. – Represented with a recent major service. One small touch up on the nose but mostly very good original paint. Very good interior with almost no noticeable wear. Even though a white over red 328 looks a bit like a drug dealer’s car, this one looks to have been carefully owned from new with only light age corresponding to the 27,370 miles showing but not represented as original. – This is a very strong price for a 328, especially one with a fair number of miles on it, but at least it bought a solid, cared for car that shouldn’t have any serious needs in the near future. 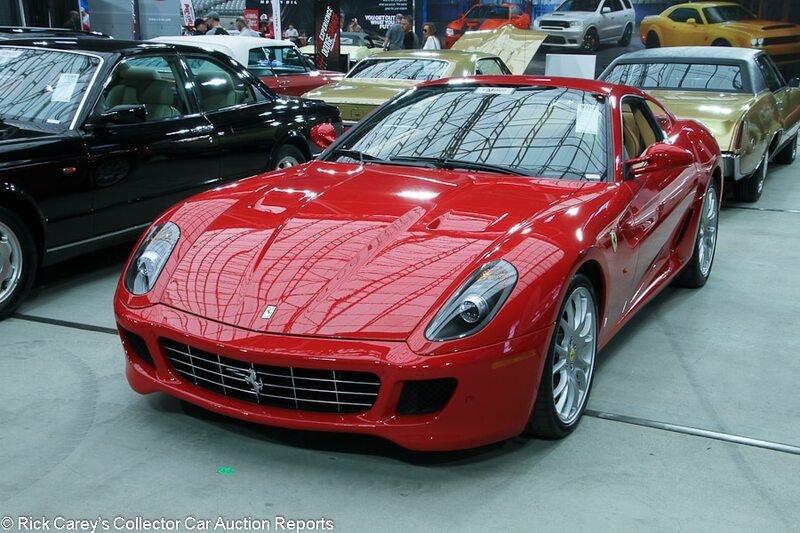 Lot # S182 2008 Ferrari 599 GTB Fiorano Berlinetta, Body by Pininfarina-Scaglietti; S/N ZFFFC60AX80162650; Rosso Corsa/Tan leather; Unrestored original, 2 condition; With Reserve; Hammered Sold at $160,000 plus commission of 10.00%; Final Price $176,000 – Yellow calipers, P Zero tires, Scuderia shields, Daytona-style seats. – One-owner car with 5,400 miles and finished in classic colors. Looks new, as it should. – This is a representative retail price that edges on the side of a good deal on account of the relatively low miles. If an end-user, the new owner should be pleased with it, but there is no flip-side at this price. It brought what it should have. Lot # S71 2011 Ferrari 599 GTO Berlinetta, Body by Pininfarina-Scaglietti; S/N ZFF70RCA9B0178078; Nero, Grigio Silverstone Opaco roof and stripes/Black leather; Unrestored original, 2 condition; With Reserve; Hammered Sold at $700,000 plus commission of 10.00%; Final Price $770,000 – Paddle shift, Red calipers, Pilot Super Sport tires, Scuderia shields, heated seats, Bose stereo. – Just 2,638 miles and like new. – This isn’t an irrational price for a 2,638 mile 599 GTO, but it is on the order of $150,000 more than two examples fetched in Scottsdale two months ago. The successful hammer bid may be $50,000 less than the low estimate, but it shows a distinct lack of comprehension of other recent results. 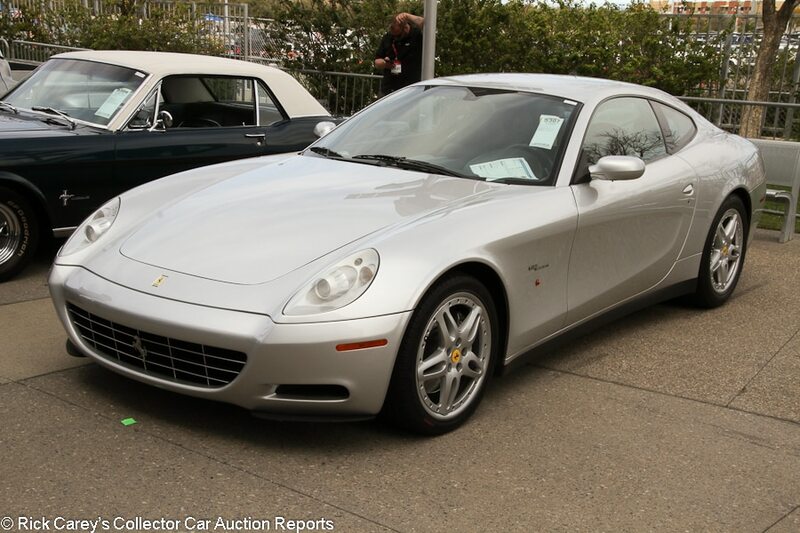 Lot # S307 2006 Ferrari 612 Scaglietti Coupe, Body by Pininfarina-Scaglietti; S/N ZFFAA54A260147660; Silver/Blue leather; Unrestored original, 2- condition; With Reserve; Not sold at Hammer bid of $60,000 – P Zero tires, two-piece wheels, Daytona-style seats. – Very good interior with hardly any wear to the driver’s seat. Quite a few light chips on the nose and the headlight lenses are slightly dull. With the 37,300 miles represented from new, this car has been used a bit and may have been a semi-daily driver for a while. The 612 was also never the most lusted after Ferrari and it’s mid-2000s styling hasn’t aged all that well, but they’re good cars and most, like this one, were bought by mature owners who took good care of them. – The reported high bid was a modest number for a lot of car and a Ferrari badge, but even the most expensive 612s aren’t asking any more than the low-100s right now and this one is far from the world’s best. 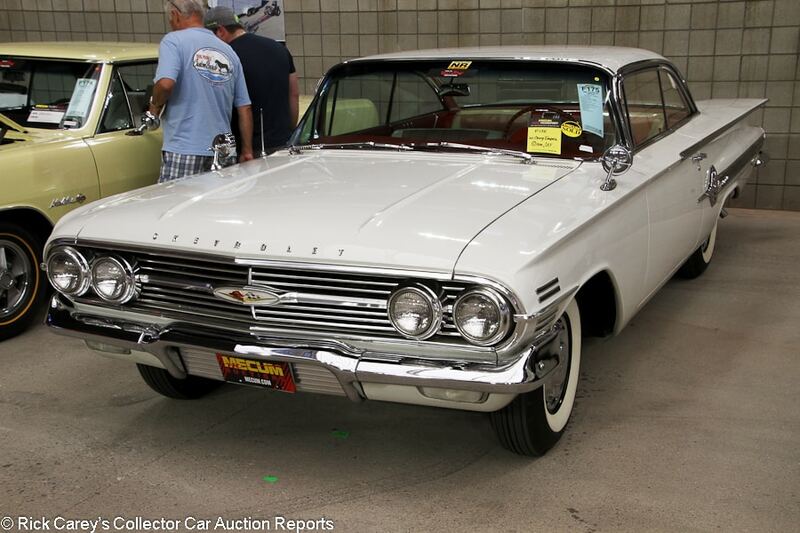 The consignor should have taken the $80,000 it was bid to at Mecum Monterey last year. The bid here is embarrassing even for a dealer-bidder. 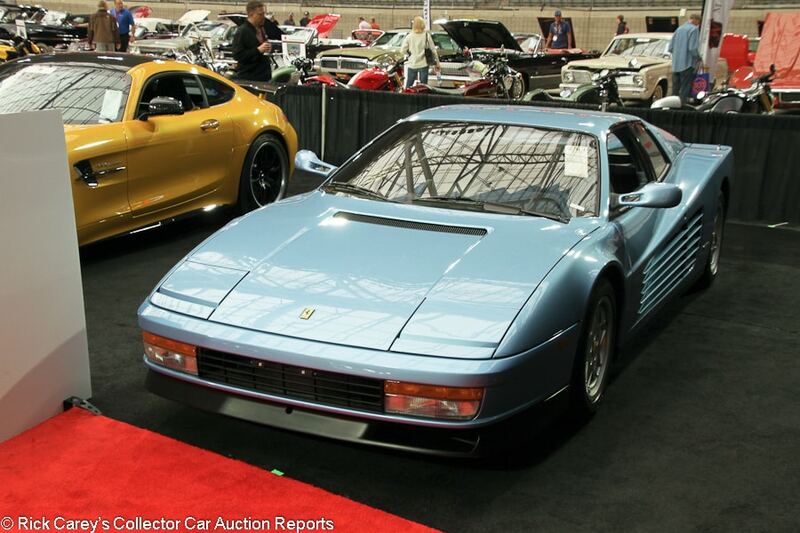 Lot # S76.1 1989 Ferrari Testarossa Coupe, Body by Pininfarina; S/N ZFFSG17A5K0081137; Azzuro Metallizato/Blue leather; Unrestored original, 2 condition; With Reserve; Hammered Sold at $165,000 plus commission of 10.00%; Final Price $181,500 – Pilot Sport tires, Classiche certified. – Major service a year ago. Showing 5,428 miles. Very light wrinkling to the seats but otherwise looks practically new and it’s finished in very rare but gorgeous colors. – Classiche certification is an unusual but certainly welcome addition to this car’s resume, and it combined with the low mileage, impeccable condition, recent service and rare but gorgeous colors for this remarkably high price. Money has been spent on this Testarossa and it is reflected in the confidence it gave bidders to venture out on a limb with this price. 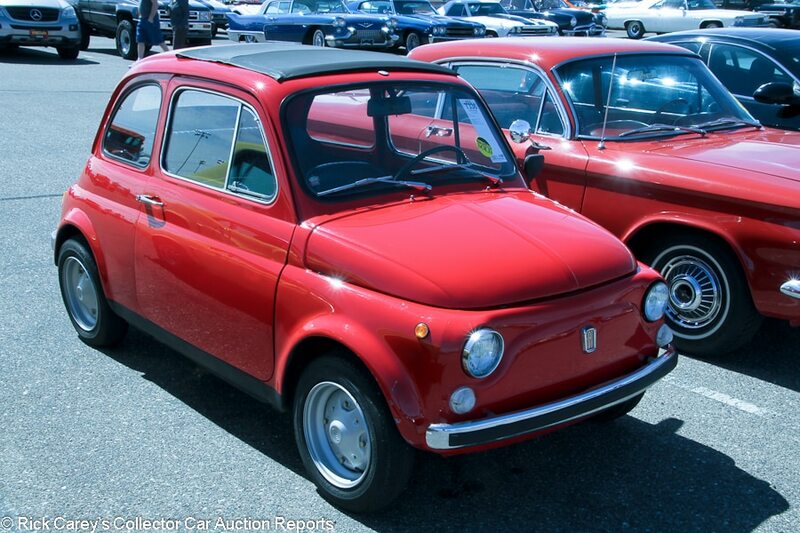 Lot # T336 1971 Fiat 500 2-Dr. Sedan; S/N 110F2557613; Red/Black vinyl; Enthusiast restoration, 3+ condition; With Reserve; Hammered Sold at $9,000 plus commission of 10.00%; Final Price $9,900 – Folding sunroof, aftermarket wheels. – Several chips and cracks on the front of the car. Uneven gaps. Good newer seats and carpets. Clean underneath. A basic restoration done relatively recently. Not perfect, but the flaws take little away from the cuteness. – It’s very hard not to regard this FIAT 500 as an exceptionally good buy for the new owner. It’s undeniably cute, even lovable like a soft fuzzy puppy, and the paint job would cost more than the price paid here. The FIAT itself appears to be sound and there’s much joy to be found in careening around in it even though it knows nothing of “crush zones” in frontal impacts. Under $10 grand doesn’t usually buy anything more than a deteriorated, rusty project and this deserves neither of those descriptors. It is a seriously good value. Lot # S317 1945 Ford 59C Pickup; S/N 666639; Beige, Green/Green vinyl; Truck restoration, 2- condition; With Reserve; Not sold at Hammer bid of $37,000 – 239/100hp, hub caps, Firestone blackwalls, single left running board spare, wood bed, floor shift, dual exhaust tips. 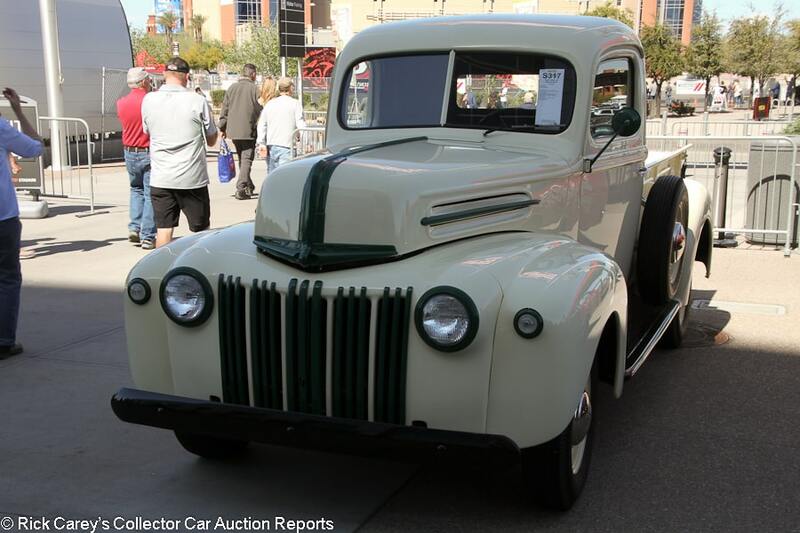 – A seldom seen ’45 Ford from a period when new civilian automobiles were extremely rare. It has fresh but truck quality paint that is good other than some small cracks behind the doors. Mostly straight body. Slightly uneven door gaps. Very clean restored engine bay and underbody. Fresh wood in the bed. Very good interior. An interesting conversation starter and really eye-catching in these colors. – It is particularly distinctive because of its black painted trim; chromium and stainless steel were still tightly controlled commodities in 1945 when it became necessary to restart civilian light truck production to support the war effort. It is seriously rare but the consignor’s decision to keep in in favor of the dollars apparently on offer might be problematic. 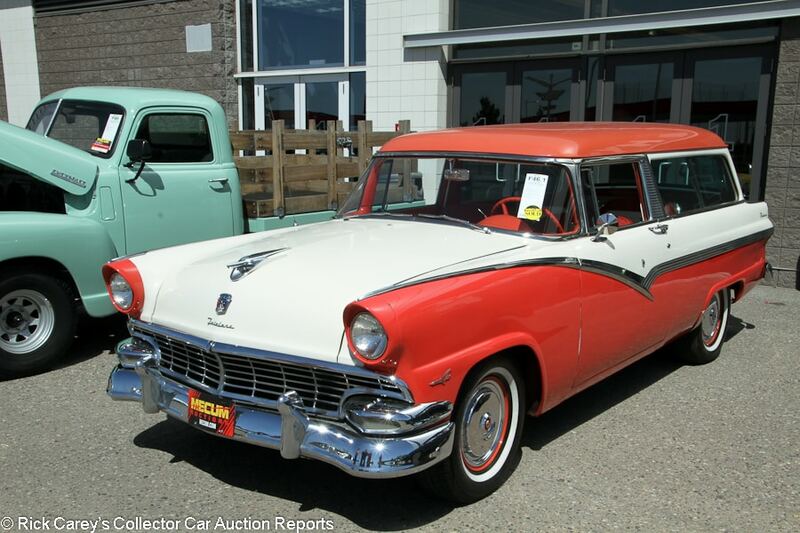 Lot # F46.1 1956 Ford Fairlane Parklane Station Wagon; S/N M6LR117758; Coral, White/Red, White vinyl; Enthusiast restoration, 3 condition; With Reserve; Hammered Sold at $23,500 plus commission of 10.00%; Final Price $25,850 – 292/202hp, automatic, wheel covers, narrow whitewalls, power steering, pushbutton radio. – Masking errors around the headlight bezels and a large chip behind the left one. Rough chrome, and there is a scrape on the right side of the front bumper. Masking errors and cracking below the drip rails, and the paint on the roof is faded. Small dents and light pitting on various pieces of trim. Erratic panel fit. Good, lightly restored interior. A little grimy and unrestored but not bad underneath. A superficial cosmetic redo done on a budget, a pretty low budget at that, and used since. An eye-catching classic wagon but no better than an average driver. 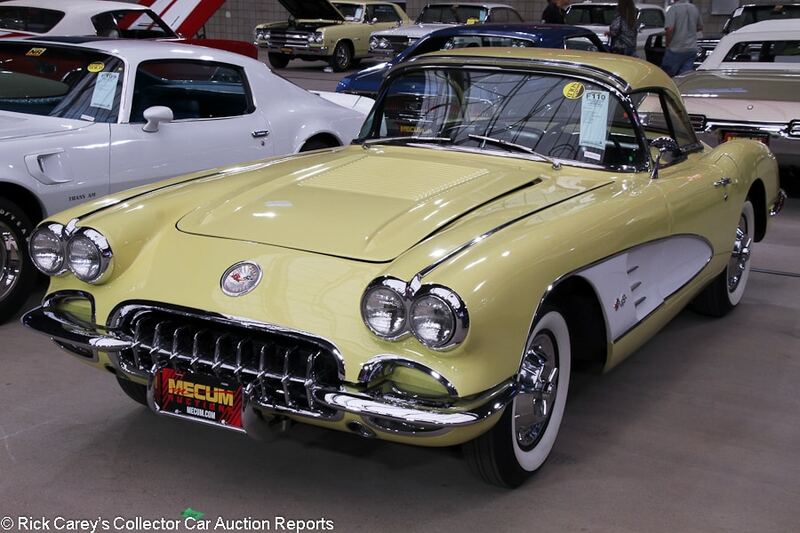 – A Mecum regular over the past couple of years, this car sold for $31,900 at Houston in 2017, hammered not sold at a $25k high bid at Los Angeles last year, and sold for $29,700 at Las Vegas last year. All are within a realistic range of what the car is worth and much more affordable than the equivalent Chevy wagon. Lot # F199 1963 Ford Falcon Sprint Convertible; S/N 3H15F200695; Wimbledon White/Red vinyl; White vinyl top; Cosmetic restoration, 3 condition; No Reserve; Hammered Sold at $22,000 plus commission of 10.00%; Final Price $24,200 – 260/164hp with 4-barrel carb added, 4-speed, Radial T/A tires, power steering, aftermarket woodrim steering wheel, later cassette stereo. – Scratch on the right front fender and three big cracks on the tail, which is disappointing because the paint is otherwise pretty good. Good older chrome. Crazing around the bottom of the rear window, clean, tight-fitting replacement top. Good interior with newer seats and carpets but original dash and gauges. The wheels are pretty aged. Unrestored but maintained underneath. About as good as it gets equipment-wise in terms of a Falcon, but the condition leaves quite a bit to be desired. – The Falcon is a fairly basic car and it will always live in the shadow of the Mustang that shares its platform, but the most valuable of the bunch is a Sprint convertible with a 4-speed. Even so, this one’s mediocre presentation led it to this deservedly middle-of-the-road price. 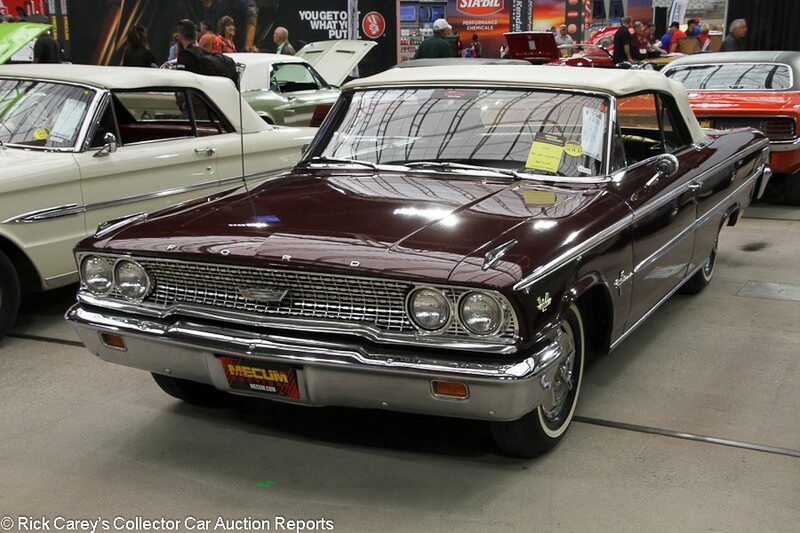 Lot # F198 1963 Ford Galaxie 500 Sunliner Convertible; S/N 3E65B129351; Royal Maroon/Black vinyl; White vinyl top; Visually maintained, largely original, 3 condition; With Reserve; Hammered Sold at $57,000 plus commission of 10.00%; Final Price $62,700 – 406/380hp engine, 4-speed, spinner wheel covers, narrow whitewalls, bench seat, factory radio, dash clock, heat and defrost, dual mirrors, column-mounted tach. – Tired but presentable original chrome and brightwork other than significant pitting on the rear bumper. Cracking taillight gaskets. Good mostly original pint. Tired original top with a yellowed plastic rear window and a long rip in the left side. Very good, lightly mellowed original interior. Clean and tidy underneath. Too good to restore. – But whether it is good enough to support the healthy premium it brought in this transaction is open to question. The combination of the big 406 engine, 4-speed and folding top is, however, intriguing and goes a long way to supporting much, if not all, of the premium price it brought but even at that it is an expensive acquisition. 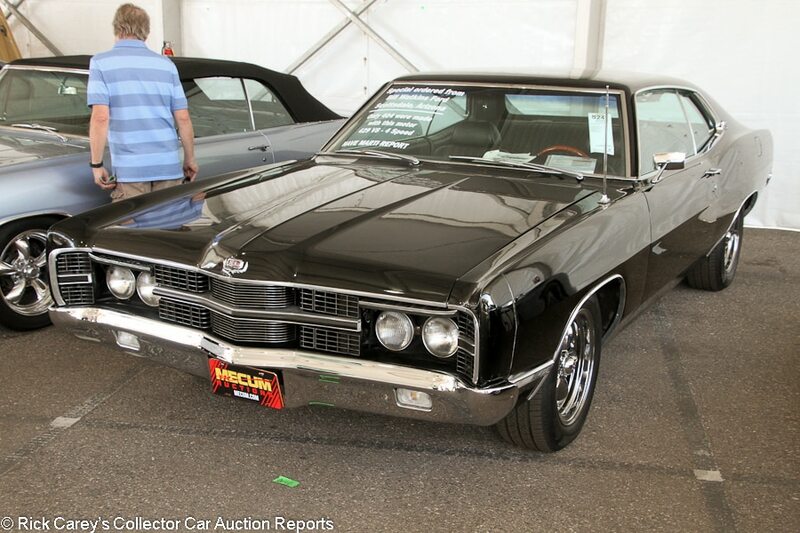 Lot # S241 1969 Ford Galaxie 500 XL SportsRoof; S/N 9D60N114790; Black/Green vinyl; Enthusiast restoration, 3+ condition; With Reserve; Not sold at Hammer bid of $25,000 – 429/360hp, 4-speed, American Racing wheels, Continental tires, power brakes, power steering, factory air conditioning, bucket seats, console, dash clock, woodrim steering wheel. 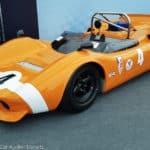 – Original 429 car. Small scuff on the hood. The paint is good but older otherwise. The badges and lights are all original and look tires, but the chrome is new and shiny. Worn original seat belts and console. The rest of the interior looks original as well, apart from the upholstery. Undercoating underneath but not fully restored. The front brake calipers have surface rust and don’t look correct. A budget restoration on a car that arguably deserves a little better. – Keep in mind that this is not the “Semi-Hemi” that went into the Boss 429 Mustangs. Its 360hp rating was probably optimistic while the “Semi-Hemi’s” 375hp rating was seriously pessimistic. The best one in the world is barely worth the reported high bid here, and this one doesn’t come close to earning such distinction. It should have been loose and selling at half the reported bid. 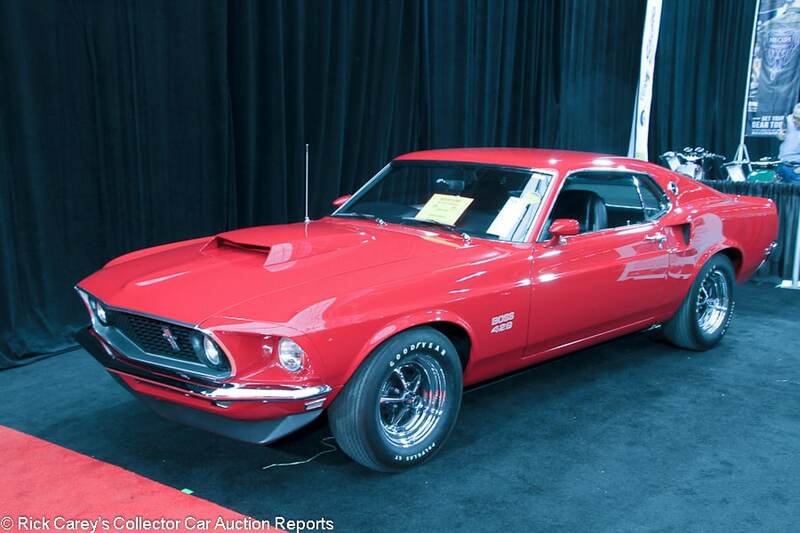 Lot # S80.1 1969 Ford Mustang Boss 429 SportsRoof; S/N 9F02Z198774; Candyapple Red/Black vinyl; Recent restoration, 2 condition; With Reserve; Hammered Sold at $190,000 plus commission of 10.00%; Final Price $209,000 – 429/375hp, 4-speed, Polyglas GT tires, front spoiler, 3.91 Traction-Lok, competition suspension, power steering, Philco radio. – Good but no longer super fresh paint and chrome. Factory gaps. Very good interior. Very clean and fully restored underneath. 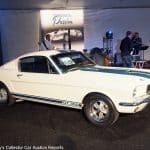 – Ford built just 857 Boss 429s, but despite how rare they are, no Mecum auction seems to be without a freshly restored Boss on offer. They usually bring much closer to 300 grand, though, and this example was reported sold by Mecum at Dallas in 2015 and Kissimmee last year both times bringing $275,000, so this result is modest. 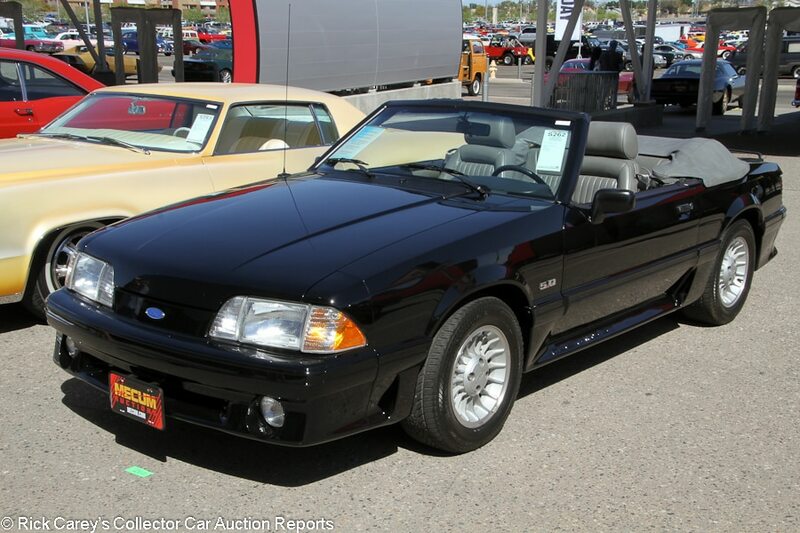 Lot # S262 1989 Ford Mustang GT Convertible; S/N 1FABP45E4KF250069; Black/Gray leather; Unrestored original, 2- condition; With Reserve; Hammered Sold at $12,000 plus commission of 10.00%; Final Price $13,200 – 302/225hp, automatic, alloy wheels, Continental tires, fog lights, power windows, cassette stereo, air conditioning, luggage rack. – Lots of tiny rock chips on the nose but mostly well maintained original paint. Very good interior with only light wear to the seats. Tidy underneath. There are scuffs on top of the windshield where the top fits. Showing 16,373 miles that is appropriate to the car’s condition, so the mileage is appealingly low but not so low that you’d feel uneasy about running it. A used late Fox-body, but used very lightly. – While some serious collectors are paying outrageous money for delivery-mile Fox-bodies, perfectly good and pampered cars with a few miles on them are still very affordable, as this result shows. 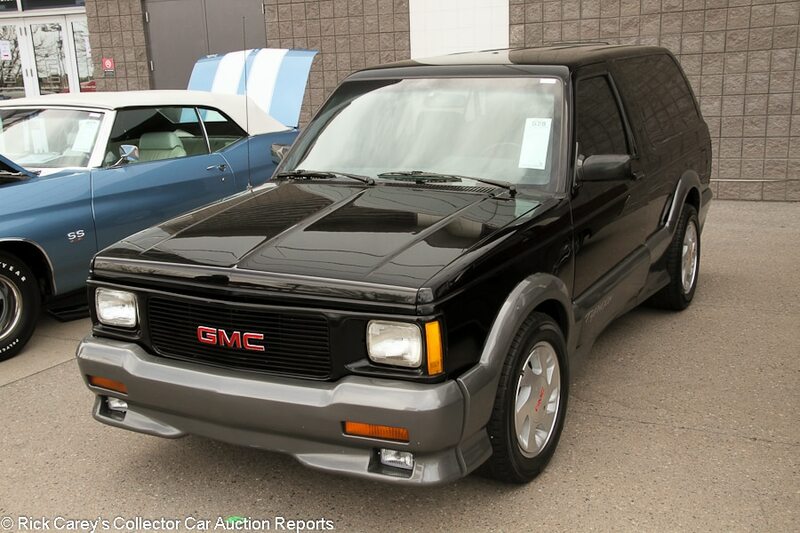 Lot # S28 1992 GMC Typhoon Sport Utility Vehicle 4×4; S/N 1GDCT18Z7N0811942; Black, Gray/Black leather; Unrestored original, 3 condition; With Reserve; Hammered Sold at $14,000 plus commission of 10.00%; Final Price $15,400 – 262/280hp turbocharged V-6, automatic, alloy wheels, Falken tires, tinted glass, Pioneer stereo. – A used Typhoon with 56,805 miles. The fender flares don’t fit straight on the body and the left front one has some cracks in it. Some light chips on the nose and a scratch on the passenger’s door. Small crack in the rear bumper. Very good interior other than light wrinkling to the seats. Typhoons and their Syclone pickup cousins are collectible sport trucks now, but quite a few like this one were driven a lot and probably driven hard. – The famous turbocharged performance of the Typhoon/Syclone has put them on collectors’ radar for a while now, and they had a big value surge that predated the more recent craze for other vintage trucks. Typhoons can bring well over 20 grand, but those are the low-mileage examples with no excuses. This result is about right for a used one. 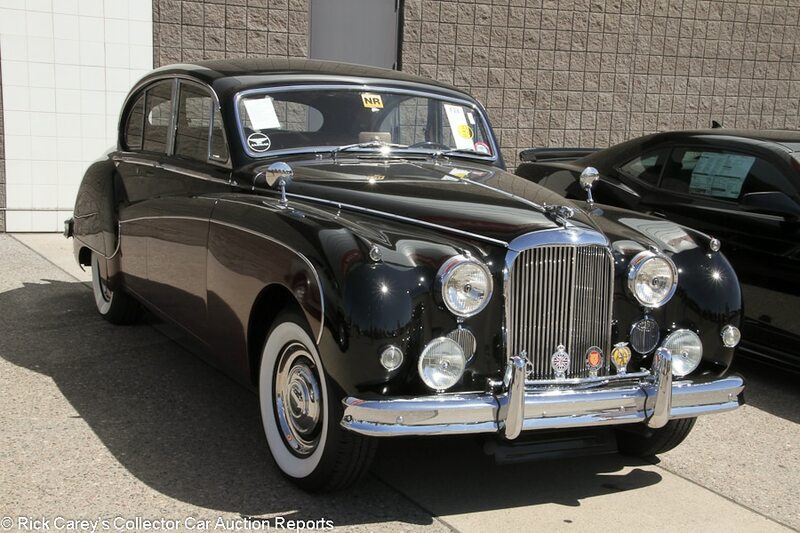 Lot # F24 1961 Jaguar Mark IX 4-Dr. Sedan; S/N 793899BW; Black, Burgundy/Tan leather; Visually maintained, largely original, 3 condition; No Reserve; Hammered Sold at $20,000 plus commission of 10.00%; Final Price $22,000 – 3781/220hp, automatic, hub caps and trim rings, whitewalls, badge bar, fog lights, dual wing mirrors, sunroof, fender skirts, original radio, rear seat tables. – Ancient paint with heavy scratching and rub through on spots on the black part, and crazing on the burgundy part. The body sides are a little wavy. The leather is OK, soft and sound for the most part other than a few very light cracks in the driver’s seat. The wood is in decent serviceable shape but it’s not perfect. Sound underneath with some restoration work but nothing major. It definitely needs paint work, but there are surely lots of little things to fix as well. – This car sold for $20,900 at Dragone Greenwich in 2015 and again at Mecum Las Vegas last November for $25,300. Large vintage luxury cars take a lot of money to put right, and the owners of this one keep putting off the major work to the next owner, but at least the car keeps getting consistently fair prices that recognize its issues. 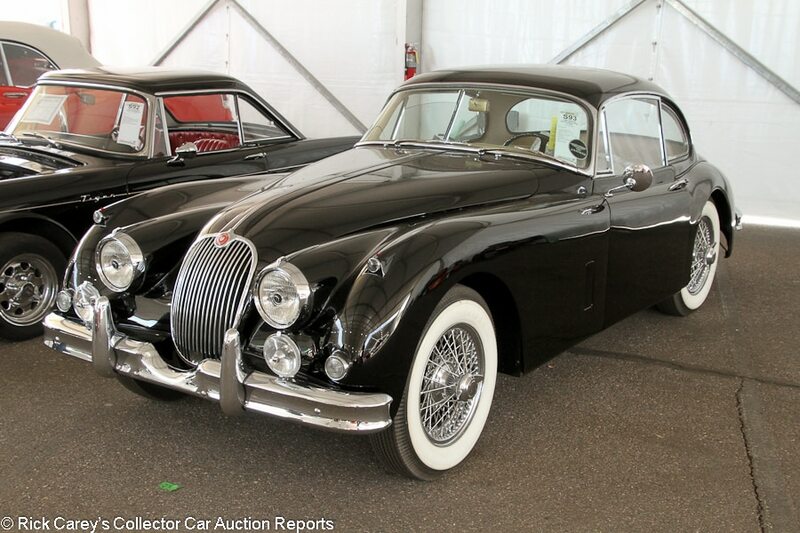 Lot # S93 1960 Jaguar XK 150 Fixed Head Coupe; S/N S836246DN; Black/Parchment leather; Older restoration, 2- condition; With Reserve; Hammered Sold at $67,000 plus commission of 10.00%; Final Price $73,700 – Centerlock wire wheels, Firestone wide whitewalls, factory overdrive, Lucas driving lights. – Scuffed up older tires. Good but older paint and chrome. Clean and restored underneath. Very attractive and fresh-looking interior. The body sides aren’t exactly laser straight but they’re not bad. A straightforward older restoration on a solid late XK. – A 3.4-liter 150 coupe is among the most affordable tickets to classic Jag two-seater ownership, but this older restored example is expensive considering its restoration’s age. It was a much fresher car in 2002 when it sold at the Christie’s Monterey auction for $56,400. It showed mileage of 41,609 (it’s now 42,056.) It was expensive in 2002 and it is even more expensive now. 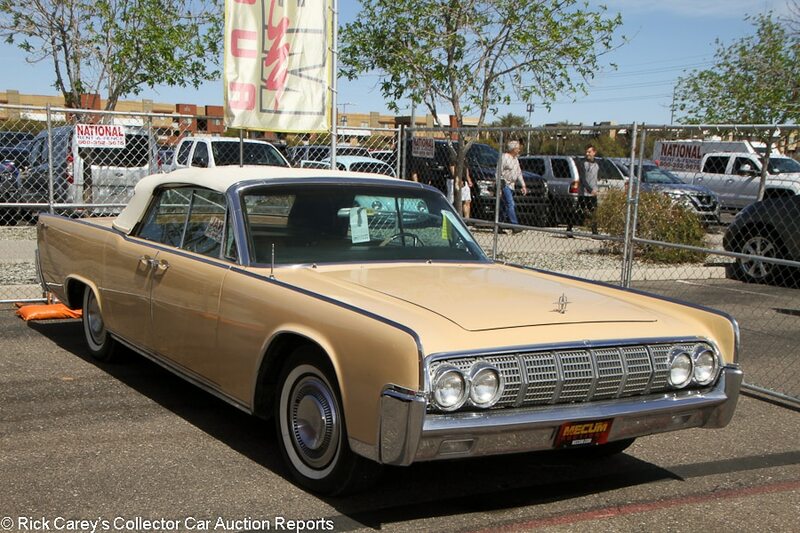 Lot # F320 1964 Lincoln Continental Convertible Sedan; S/N 4Y86N402581; Butterscotch/Tan vinyl; White vinyl top; Visually maintained, largely original, 3 condition; With Reserve; Not sold at Hammer bid of $30,000 – Wheel covers, narrow whitewalls, air conditioning, pushbutton radio. – Sound but dulled original chrome, and the front bumper doesn’t quite fit straight. A few small dings on the sides of the body, which isn’t quite straight either. Older replacement top. Sound, lightly worn original interior. Tired but maintained and complete engine bay and underbody, but there is some surface rust in the wheel wells. Enjoyable as-is, which is good since these are expensive cars to restore. – The seller may know something not obvious to the rest of the world because the reported high bid here is fully appropriate to the equipment and condition of this Continental, not to mention the dubious color scheme. 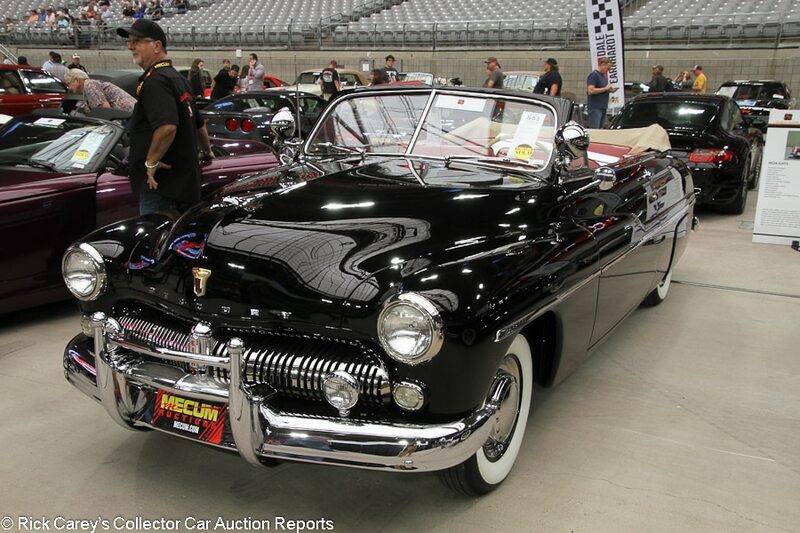 Lot # S53 1949 Mercury 9CM Convertible; S/N 9CM153730; Black/Red leather, Tan cloth; Older restoration, 2- condition; With Reserve; Hammered Sold at $72,000 plus commission of 10.00%; Final Price $79,200 – 255/110hp, wheel covers, whitewalls, fender skirts, cloth boot cover, dual spotlights, column shift, factory radio, dash clock, defrost, fog lights, power windows, dual mirrors. – Tired older chrome. Shiny and blemish-free but older paint. Mostly good restored interior, but there is some serious cracking in the steering wheel and a piece of the center of it is missing. Very clean and restored underneath. An eye-catching car with lots of desirable extras and it has been restored, but on closer inspection it has plenty of issues that deserve to be dealt with. – Those issues were overlooked in the bidders’ desire for this Mercury, a car that deserves to be called a “classic” even if by any recognized definition it isn’t. It would have been a sound value at the $65,000 low estimate, and running up a few thousand dollars more isn’t unreasonable, just generous. 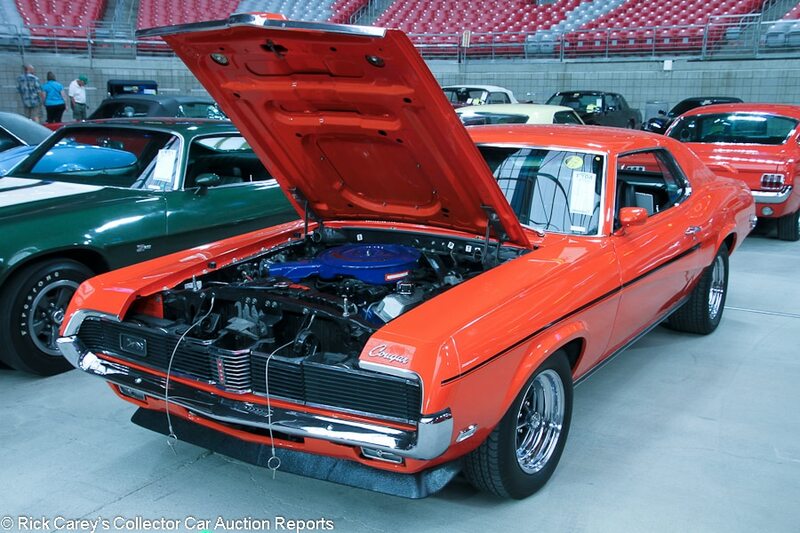 Lot # F104 1969 Mercury Cougar Eliminator 2-Dr. Hardtop; S/N 9F91S580693; Competition Orange, Black/Black vinyl; Older restoration, 2- condition; With Reserve; Hammered Sold at $41,000 plus commission of 10.00%; Final Price $45,100 – 390/320hp, automatic, store brand tires, non-original Magnum 500 wheels, hood pins, power steering, power brakes, Philco radio, heat and defrost, spoilers, console. – Clean and restored but not overly detailed engine bay. Good older paint and chrome other than masking errors around the rear window. Lightly faded gauges but mostly good original interior. Clean underbody. A sound older restoration, but lightly aged and never done to super high standards in the first place. – Available with a 302, 351, 390 or 428, the Cougar Eliminator offered loud colors and high performance that was a bit uncharacteristic for Mercury at the time, and today the Eliminator offers a pretty good value compared to other more well-known muscle cars. This one sold for $33,480 at Mecum Indy in 2014, and today’s stronger result is still realistic for a decent car with a desirable driveline. 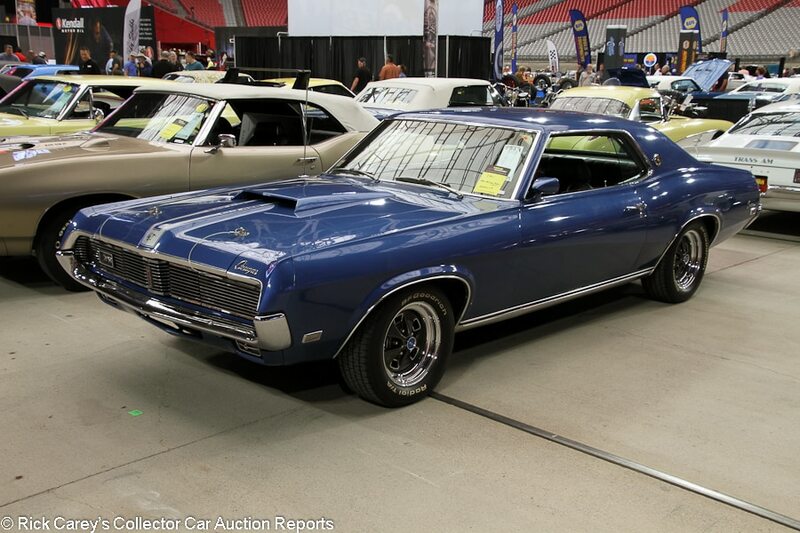 Lot # F94.1 1969 Mercury Cougar XR-7 2-Dr. Hardtop; S/N 9F93R589517; Dark Blue Metallic/Black leather; Visually maintained, largely original, 3- condition; With Reserve; Hammered Sold at $33,500 plus commission of 10.00%; Final Price $36,850 – 428/335hp Cobra Jet engine, Radial T/A tires, power brakes, factory air conditioning, tinted glass, bucket seats, Philco radio, hood pins. – Tired, possibly original paint with blisters on the hood, roof and tail plus several chips throughout. Good older chrome and clean wheels. Wrinkled but soft and clean original leather. Lightly faded gauges and the woodgrain sticker below the shifter is coming up. The underbody is a bit oxidized and there’s light surface rust. Rare equipment, not missing anything, and a solid platform on which to start a straightforward restoration. – And at this price, it’s a lot of car and engine for the money, plus it leaves the new owner with money left over to start working on it. It wouldn’t be a shame to leave it as it is and just enjoy it on summer evenings, leaving the restoration to another owner. It’s good enough to be used, if not with pride except for the modest amount of money invested in it and its Cobra Jet powerplant. 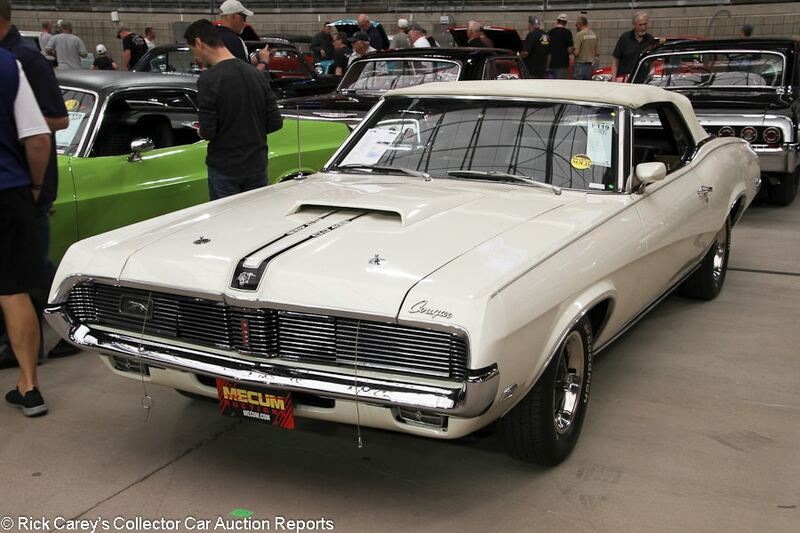 Lot # F119 1969 Mercury Cougar XR-7 Convertible; S/N 9F94R523524; Wimbledon White, Black stripe/Saddle leather; White vinyl top; Older restoration, 3+ condition; With Reserve; Hammered Sold at $67,000 plus commission of 10.00%; Final Price $73,700 – 428/335hp Cobra Jet with Ram Air, automatic, hood pins, 3.25 limited-slip, competition handling package, power steering, power brakes, power windows, factory radio, Marti Report documented. – There are some light wrinkles on the decals on the hood. Good older paint and chrome. Older replacement top with light wrinkling and discoloration. Wrinkled and lightly cracked original leather, but it looks pretty good for 50 years old and the 97,043 miles showing on the odometer. The rest of the interior is original but only lightly worn as well. Older restored underneath. A very inherently cool luxury muscle car with a lot going for it, but it’s a long way from fresh. – This is an unusual combination for a convertible but some desirable options that should make it an outstanding cruiser around town or a fairly lazy highway driver. It brought a sound and realistic price that is fair to both the seller and the buyer. 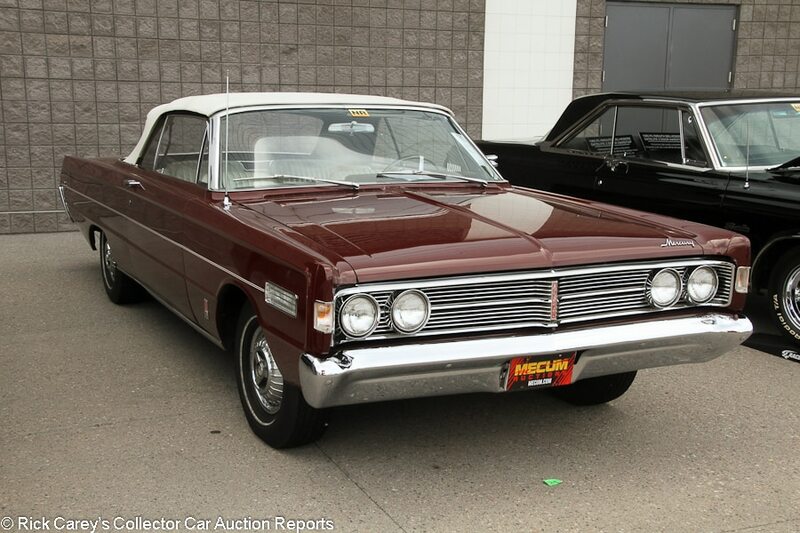 Lot # S29 1966 Mercury S-55 Convertible; S/N 6W46Q553633; Burgundy/White vinyl; White vinyl top; Visually maintained, largely original, 2- condition; No Reserve; Hammered Sold at $27,000 plus commission of 10.00%; Final Price $29,700 – 428/345hp engine, automatic, wheel covers, narrow whitewalls, power steering, power brakes, pushbutton radio, rear seat speaker, bucket seats, floor shift. – Stored in a California Mercury dealer for over 30 years. Possibly original paint that shows very well despite several isolated touch ups. Good, tight-fitting original top but there are a few small rips as well as some light discoloration. Tidy and well preserved underneath. Very well kept, lightly aged original interior. Likely one of the best unrestored S-55s around, and they’re not often seen in any condition. 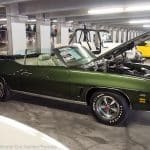 – This is one of 669 S-55 (a trim and performance package designated by Mercury as a separate model) convertibles built in 1966 and its result here carries a modest and well-deserved preservation premium. By many standards the little-known S-55 is seriously overlooked and is a better value than the marketplace gives it credit for. 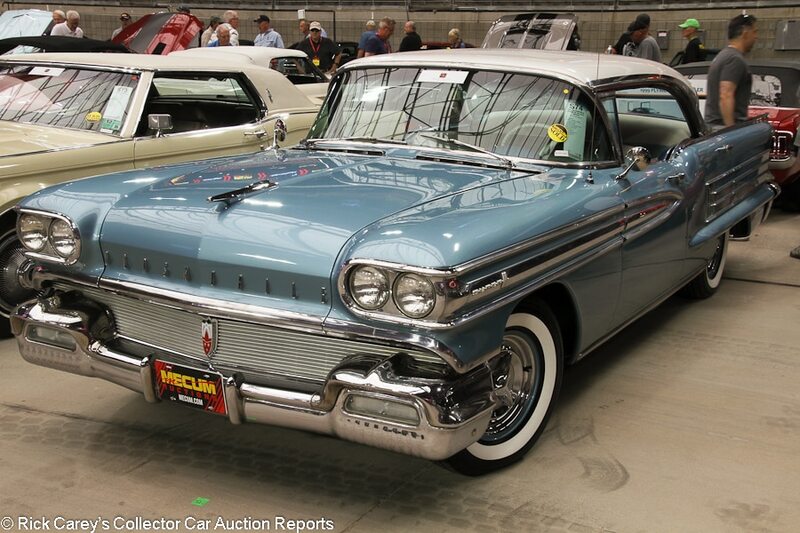 Lot # S74 1958 Oldsmobile Super 88 4-Dr. Hardtop Holiday; S/N 588K064SS; Banff Blue, White roof/Blue and White vinyl, Blue cloth; Older restoration, 3+ condition; With Reserve; Hammered Sold at $24,000 plus commission of 10.00%; Final Price $26,400 – 371/305hp, automatic, wheel covers, whitewalls, power steering, power brakes, heat and defrost, pushbutton radio. – Light pitting on the headlight bezels and door handles. A few small dents on the body side trim. The original chrome bumpers are quite dull. Dull window trim. Very good repaint. Even gaps. Very good interior with newer seats and carpets, and other than light wear on the switchgear the original dash looks very good. Clean and restored underneath. Lots of money has been spent on this car already, so it’s strange that it isn’t fully redone. Yes, chrome and trim work is expensive, but it’s a huge stone to leave unturned on an otherwise strong car. – And if they overlooked the chrome, what else that’s even less obvious has been treated to a lick and a promise? The bidders didn’t seem to notice, or at least they didn’t care, and they paid a premium price for less than a premium car. 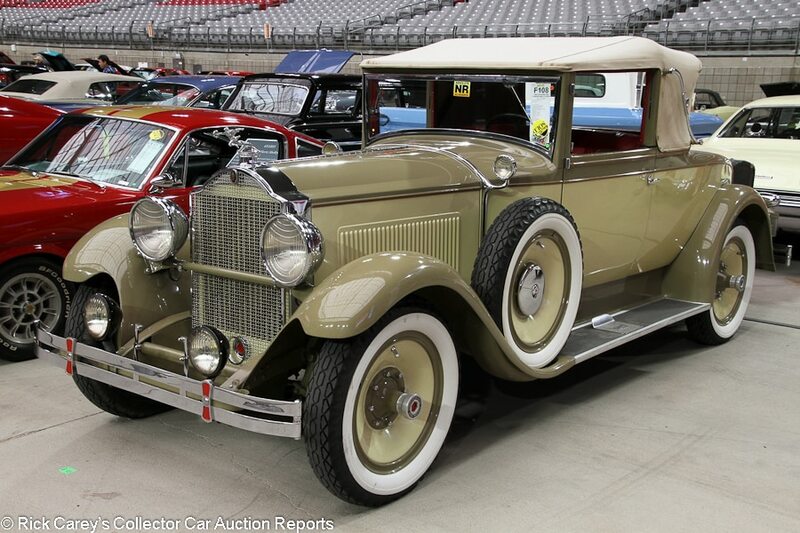 Lot # F108 1929 Packard 626 Speedster Roadster; S/N 273147; Tan, Beige/Red leather; Beige cloth top; Older restoration, 3+ condition; No Reserve; Hammered Sold at $50,000 plus commission of 10.00%; Final Price $55,000 – Disc wheels, whitewalls, dual sidemount spares, Goddess of Speed mascot, fog lights, landau bars, luggage trunk, Jaeger dash clock, golf bag door. – The fog lights look like they came out of the basement, but the rest of the car is pretty decent. Good shiny paint other than some rub through and a long scratch on the tail. Mild discoloration on the tail. Good interior. Older restored with light road wear underneath. It’s a Six and it’s far from perfect so it isn’t worth a ton, but it’s a solid classic Packard with good presence. A good driver. 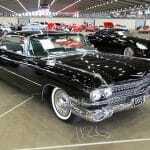 – This affordable and usable Packard has a consistent auction record that supports the result here. It was offered at the Leake Dallas auction in 2005 where it was reported bid to $52,000, sold at the Kruse Houston auction in December 2006 for $59,400 and at Mecum’s Dallas sale in 2012 for $57,420. The age of the restoration is consistent with the auction history and this is a sound value for the money even with its dated livery. 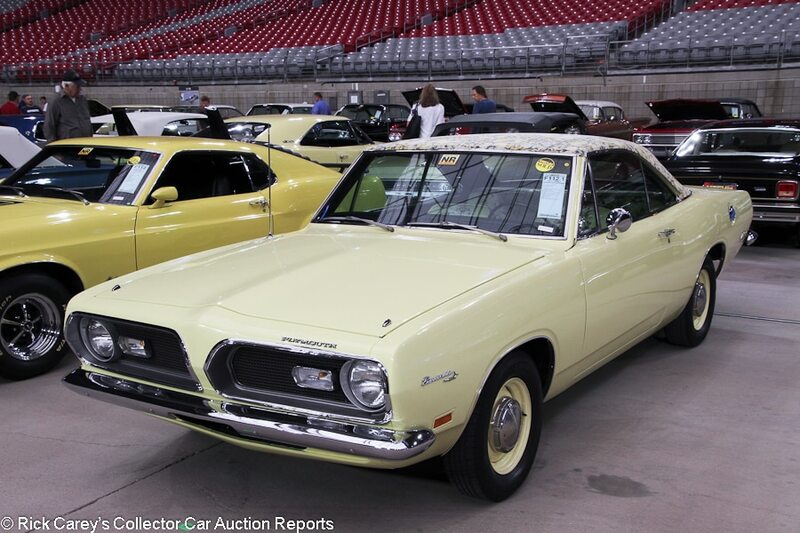 Lot # F112.1 1969 Plymouth Barracuda 2-Dr. Hardtop; S/N BH23F98140342; Sunfire Yellow, Floral pattern vinyl roof/Yellow vinyl with floral pattern inserts; Older restoration, 2 condition; No Reserve; Hammered Sold at $35,000 plus commission of 10.00%; Final Price $38,500 – 318/230hp, automatic, hub caps, Goodyear tires, bucket seats, console. – Rare Mod Top option fitted new. Fully restored nearly 10 years ago. The paint and chrome are very good and haven’t lost much of their freshness. The roof vinyl is very good. Very good restored interior and underbody. Nothing exciting under the hood, but the in-your-face floral and yellow is a guaranteed conversation starter, and you’ll regularly be giving a history lesson about how people could actually order your Barracuda like this new. – This is a $25,000 Barracuda with a big premium for the colorful and whimsical Mod Top and matching interior. The eye-appeal and the well-preserved restoration are impressive and it’s impossible to argue with the premium it brought. Even though this auction venue is in Arizona where seasons have little meaning, the fresh, flowery livery is perfectly positioned to bring a Spring smile to buyers from regions where flowers are just beginning to bloom. Its placement here in late March is topical timing at its best and worked to the seller’s advantage. 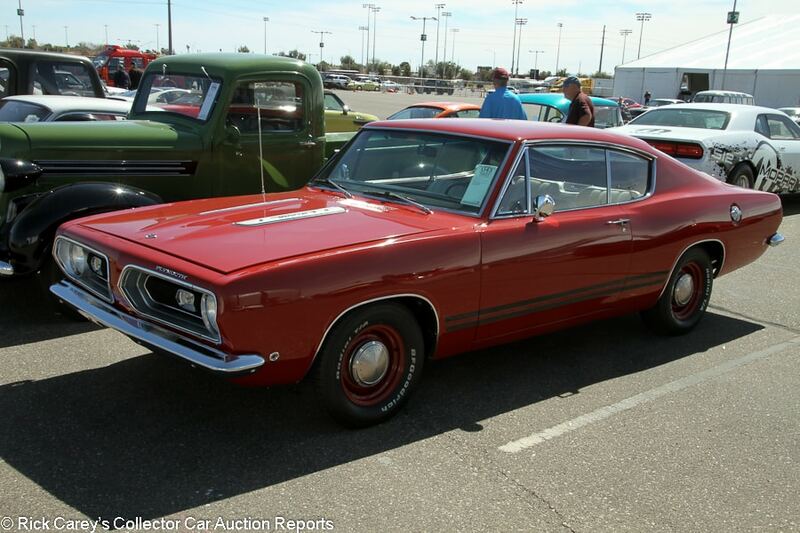 Lot # U43 1968 Plymouth Barracuda Formula S Fastback; S/N BH29H8B410623; Red, Black/White vinyl; Enthusiast restoration, 3+ condition; With Reserve; Hammered Sold at $34,500 plus commission of 10.00%; Final Price $37,950 – 383/300hp, automatic, hub caps, Radial T/A tires, floor shift, 3.91 Sure Grip, bucket seats, factory radio. – Represented as a matching numbers one-owner car. Light pitting and scratches on the trim around the grille, but the bumpers are good and shiny. Heavy scratches on most of the glass. The paint is decent but older and there is some orange peel on the body sides. Erratic gaps and fit on the hood and trunk. Newer seats and carpets, but the rest of the interior is original and a little tired. Mostly restored underneath. A rarely seen `68 Formula S-spec Barracuda and it’s been restored, but all the work was on a budget, missed on a lot of important details and is a disappointment. – At least the result here won’t disappoint the seller as it brought a relatively handsome price. It’s a rare model, although it offers no particular performance attributes and its presentation is at best mediocre. It’s not expensive enough to be outrageous, but it is expensive enough to be expensive. 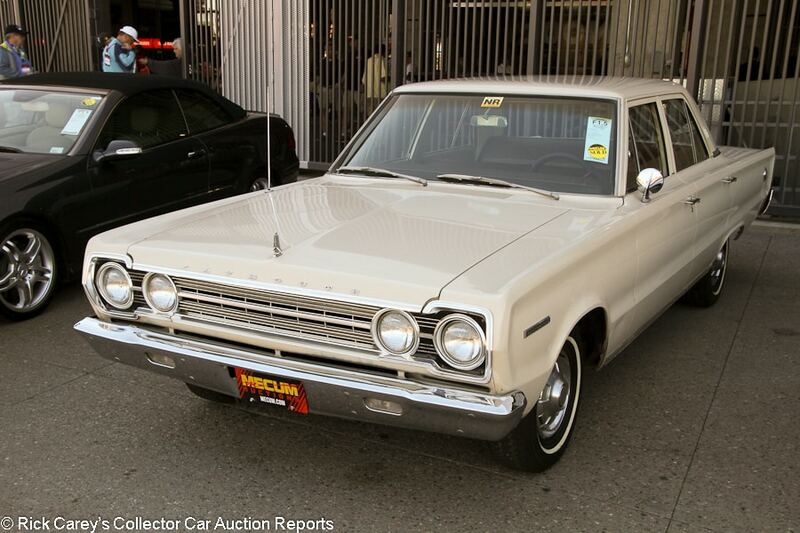 Lot # F1.5 1967 Plymouth Belvedere 4-Dr. Sedan; S/N RL41D75102829; Beige/Brown vinyl, Beige cloth; Visually maintained, largely original, 3 condition; No Reserve; Hammered Sold at $2,250 plus commission of 10.00%; Final Price $2,475 – 273/180hp, three on the tree, wheel covers, narrow whitewalls, power steering, air conditioning, pushbutton radio. – Tons of touch ups and scratches throughout on the older repaint. Erratic panel fit. Cracked taillight lenses. Some components replaced underneath, but never fully taken apart and redone. Newer seat covers and carpets but the rest of the interior is original. It’s mostly good, but the headliner has some issues. Nothing more than a driver, but it’s rare to see a plain-Jane four-door Belvedere sedan like this in any condition. – Admittedly this is “just a car”, and not a very interesting one, but its condition and survival confer “intriguing” upon it. Its price is even more intriguing and is a bargain purchase for the early Friday bidder who snapped it up. Lot # F234 1968 Plymouth GTX Hemi 2-Dr. Hardtop; S/N RS23J8A183444; Green, Green vinyl roof/Green vinyl; Older restoration, 2- condition; With Reserve; Hammered Sold at $52,000 plus commission of 10.00%; Final Price $57,200 – 426/425hp Hemi, automatic, Rallye wheels, red line tires, floor shift, console, electronic ignition. – Represented as a matching numbers Hemi. There’s a tiny dent in the front bumper but the chrome and brightwork are good other than light pitting on the mirror. Very good paint and roof vinyl. Factory gaps. Serious pitting on the steering wheel, but the rest of the interior is good with newer upholstery and a well preserved dash. Fully restored underneath a while ago. A neat car in attractive colors and equipped with the hot engine. Not perfect, but more than good enough to be proud of. 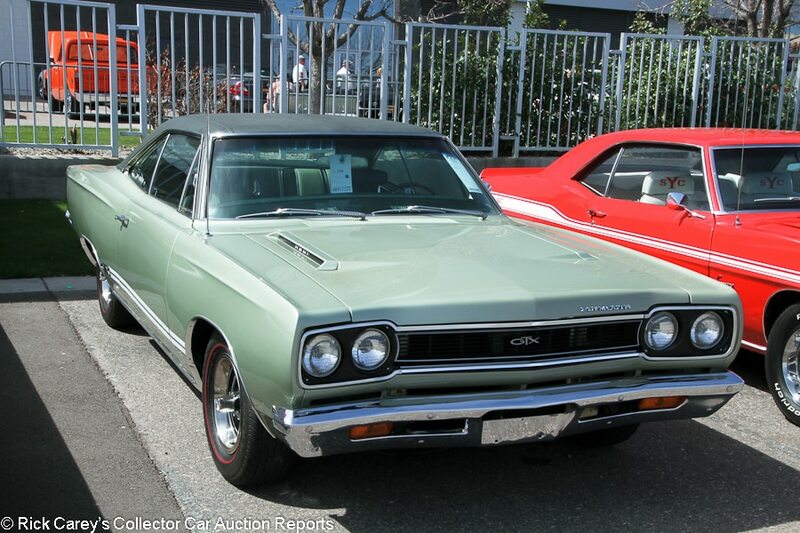 – Either the bidders didn’t believe the statement that it’s matching numbers or they had all left the Stadium for dinner and a movie because this is 440, not Hemi, GTX money and a notable value for the new owner at this price. 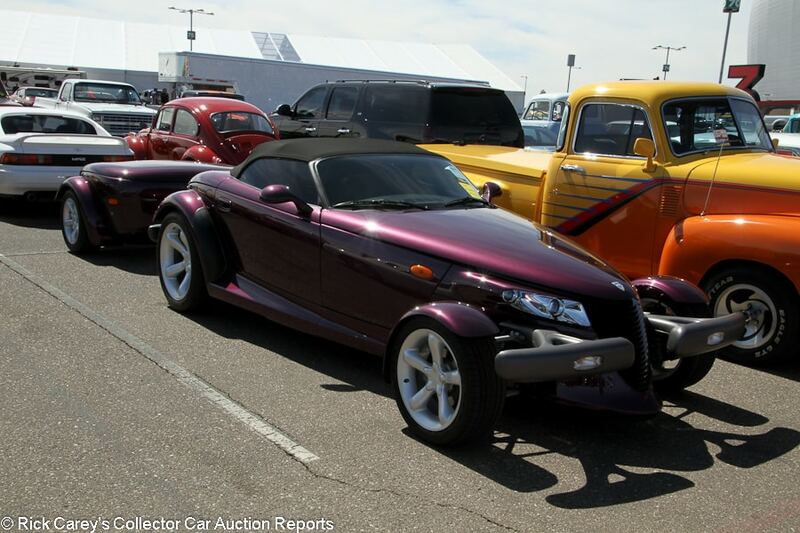 Lot # T204 1999 Plymouth Prowler Convertible; S/N 1P3EW65G6XV500156; Purple Metallic/Gray leather; Black cloth top; Unrestored original, 2 condition; With Reserve; Hammered Sold at $25,500 plus commission of 10.00%; Final Price $28,050 – Alloy wheels, Goodyear Eagle tires, trailer, tinted glass. – A 5,200-mile Prowler in the classic colors and with the matching trailer, a $5,000 option when the car was new. In like-new colors as it should be, making it a collector-grade example. – Prowlers don’t seem to have had their day in the sun yet, if they ever will, and there is no shortage of them crossing auction blocks. This is about as good an example that could be hoped for, but its reception and the result it brought both were lackluster. The seller would have been reasonable to expect 30 grand, but it was not to be and both the bidders and the consignor agreed this result was appropriate. 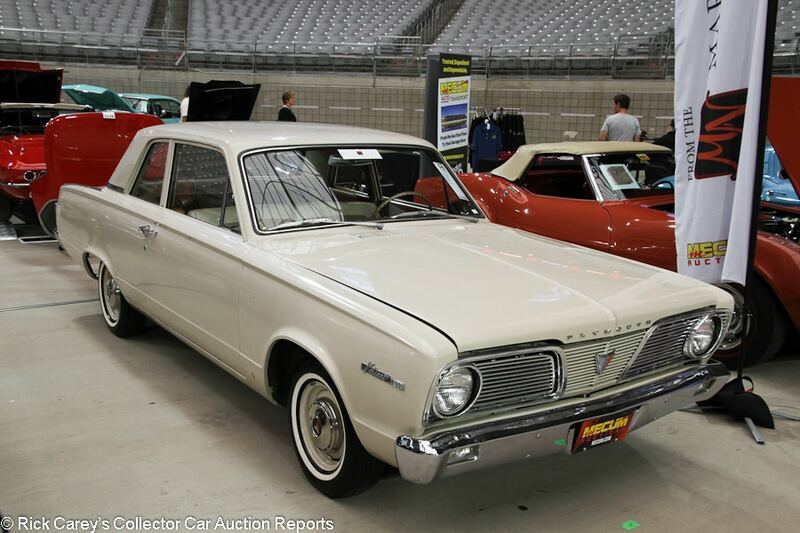 Lot # S49 1966 Plymouth Valiant V100 2-Dr. Sedan; S/N VL21A62692800; Beige/Beige vinyl, cloth; Unrestored original, 3+ condition; With Reserve; Hammered Sold at $7,500 plus commission of 10.00%; Final Price $8,250 – 170/101hp slant six, automatic, hub caps, heat and defrost, radio delete, column shift. – Tired but presentable and possibly original paint and chrome with numerous but small scratches, chips, touch ups and cracks. Very well preserved original interior. Some surface rust underneath but clearly maintained over the years. Strange for someone to take such good care of such a bland, beige car. A pleasant surprise even if it’s far from perfect. – With Fiat 600s and the like commanding serious five-figure prices the acquisition of this Valiant even for this much money is understandable. Few survive, and even fewer (if any) in such loved and preserved condition. It won’t distinguish itself in stoplight drags, but on a Mopar show field it stands a good chance of being unique, stature that is not usually attainable for well under $10 Grand. Lot # U78 1961 Pontiac Catalina Safari Station Wagon, 6-pass. ; S/N 361L11914; Dawnfire/Dawnfire, White vinyl; Cosmetic restoration, 3+ condition; With Reserve; Not sold at Hammer bid of $27,000 – 389 cid with added Tri-Power, automatic, hub caps, Firestone tires on the front, store brand tires on the front, roof rack, pushbutton radio, dash clock, PHS documents. – Chips on the wheels. Tidy but not immaculate engine bay and underbody with thick old undercoating on the chassis. Light cracks in the taillight lenses. Some chips on the wheels. Good repaint other than some chips on the panel edges. Good newer seats, while the rest of the interior is original but sound. A straightforward, basic cosmetic restoration on a rarely seen Catalina wagon and good enough to be enjoyed as is. – The reported high bid was perfectly fair for this car, especially considering that it sold for $24,200 at Auburn Fall last year. It also hammered not sold at a $30,000 high bid at Silver this year. The fees are going to start to add up and the offers aren’t likely to get any higher, so this may soon look like a missed opportunity. Even after a reasonable seller’s commission and entry fees the consignor would have come close to breaking even on this transaction and holding out for over $30K is an unreasonable expectation for this Safari’s presentation. 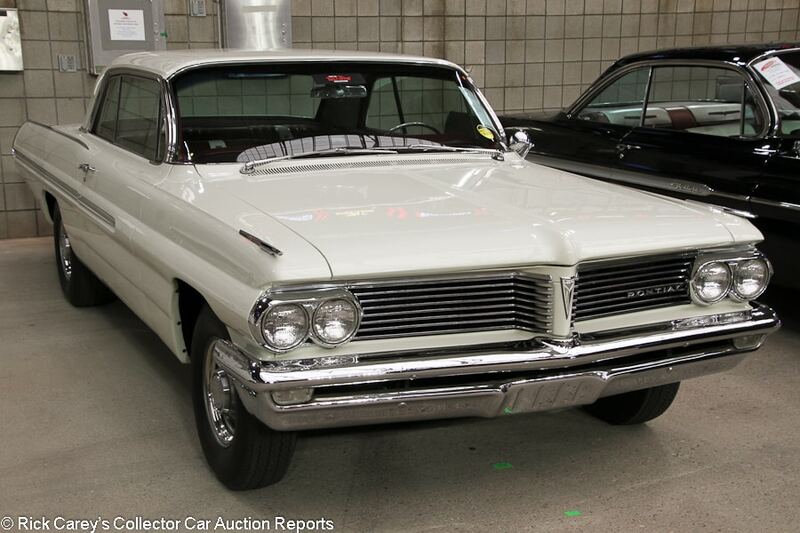 Lot # F177 1962 Pontiac Catalina Super Duty Lightweight 2-Dr. Hardtop; S/N 362P80184; White/Maroon, White vinyl; Older restoration, 2- condition; With Reserve; Hammered Sold at $140,000 plus commission of 10.00%; Final Price $154,000 – Eight-lug wheels, Super Duty 421/405hp dual quad engine, 4-speed, 4.30 Safe-T-Track, radio and heater delete, Hurst shifter, tinted glass, aluminum fenders, hood and bumpers. – Very rare 4-speed Super Duty. Previously in the Floyd Garrett Muscle Car Museum. Some bubbling in the chrome on the left side of the front bumper and serious pitting on the rear bumper. The doors stick out slightly at the bottom. Good older paint and good older restored interior with nearly no wear. Very clean underneath. Fast, rare and attractive, but it needs another round of chrome work. – A Catalina Super Duty Lightweight like this, particularly after a nut-and-bolt restoration, is not likely to do much more than look good in a collection garage or be driven carefully on and off show fields. That’s exactly what seems to have been the history of this example and the bidders recognized it as the quality specimen it is, paying a generous retail price for it. Lot # S176 2002 Pontiac Firebird Trans Am SLP Firehawk Coupe; S/N 2G2FV22G722116108; Pewter Metallic, Glass T-tops/Ebony leather; Unrestored original, 2 condition; With Reserve; Not sold at Hammer bid of $27,000 – Chromed wheels, Firestone Firehawk tires, T-tops, Monsoon CD stereo. 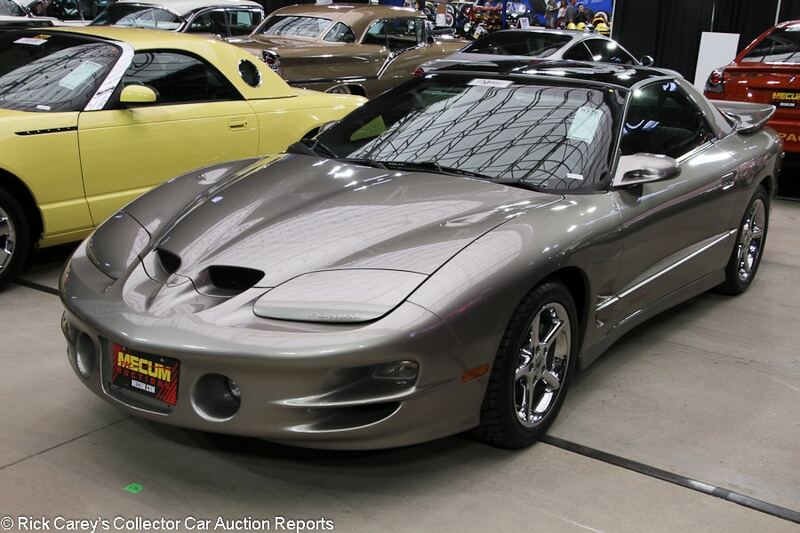 – Very rare SLP-modified Trans Am Firehawk, in essentially new condition with 1,982 miles. – SLP cars have been getting more and more collectible, and this is a top notch example, but for a car equipped with an automatic the reported high bid should have gotten it done. 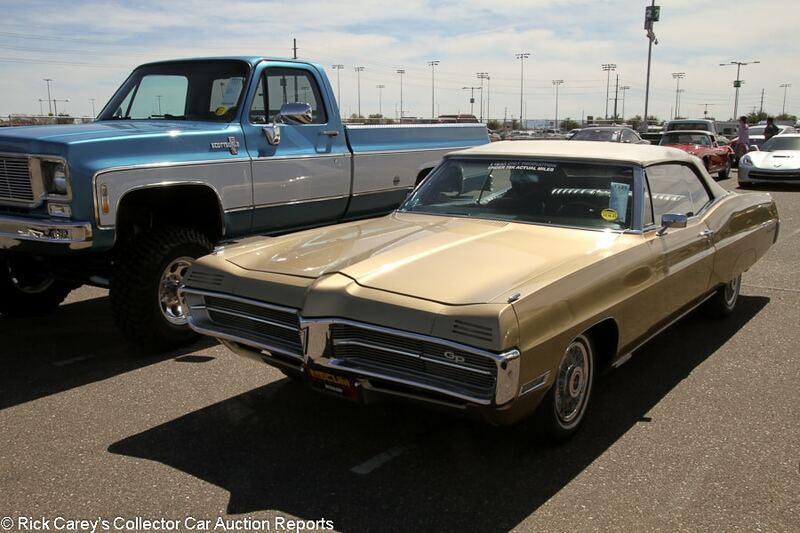 Lot # T321 1967 Pontiac Grand Prix Convertible; S/N 266677X187035; Gold/Black vinyl; White vinyl top; Visually maintained, largely original, 3+ condition; With Reserve; Hammered Sold at $19,000 plus commission of 10.00%; Final Price $20,900 – 326 V-8, 2-barrel, automatic, wire wheel covers, narrow whitewalls, fender skirts, power top, tilt steering column, power steering, power brakes, later Pioneer cassette stereo. – One year only Grand Prix convertible, one of 5,856 built. Represented as matching numbers but the 326 was not an RPO on the Grand Prix which came with a 400/350hp 4-barrel as standard.. Some orange peel, chips and scratches on the nose. Some other small chips and scratches throughout. Small dent in the rear bumper. The top is a little dirty. Scratched up window frames. Well-kept original interior with light wear. Mostly original but maintained underneath. Relatively rare, but nothing special in terms of either equipment or condition and with the 326 (if that’s what actually under the hood) decidedly anemic. – This is a pretty special Grand Prix, but the engine is disappointing and more appropriate to a Tempest. It’s a rare car, and not rare in a good way, and the seller should be exultant to get this much for it. On the other hand, for a weekend driver this is a modest price in a rare drop-top Grand Prix. 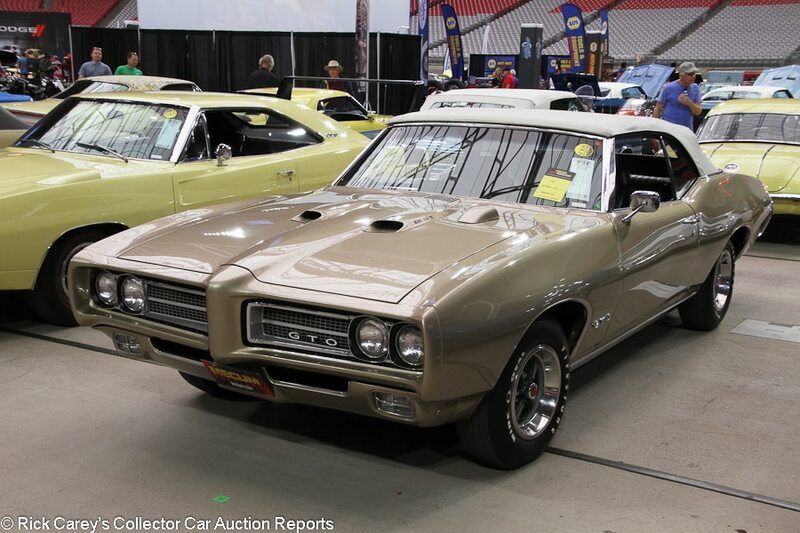 Lot # F94 1969 Pontiac GTO Convertible; S/N 242679B170876; Champagne/Black vinyl; White vinyl top; Older restoration, 2- condition; With Reserve; Hammered Sold at $97,500 plus commission of 10.00%; Final Price $107,250 – 400/370hp Ram Air IV engine, Rally wheels, Wide Oval tires, hood tach, Safe-T-Track, wood steering wheel, Hurst shifter, factory radio, power brakes. – Excellent paint aside from a small crack at the top of the trunk lid. The top is a little dirty and wrinkled. There is a lot of condensation inside the hood tach. Light scratching on the driver’s seat, maybe from some keys or something, but the rest of the interior is restored and clean. Very clean underneath. In terms of equipment, it doesn’t get much better than this, although it’s older restored condition leaves a few things to be desired. – Sold for $90,750 at Russo Scottsdale in 2007 and is modestly priced here in Glendale for its equipment and presentation. In Hagerty Price Guide terms this result is light, but the Guide lags the market and even for Ram Air IV convertibles there’s no shortage of inventory in the market. The seller was prudent to accept the money and the buyer kept some powder dry in a soft market. 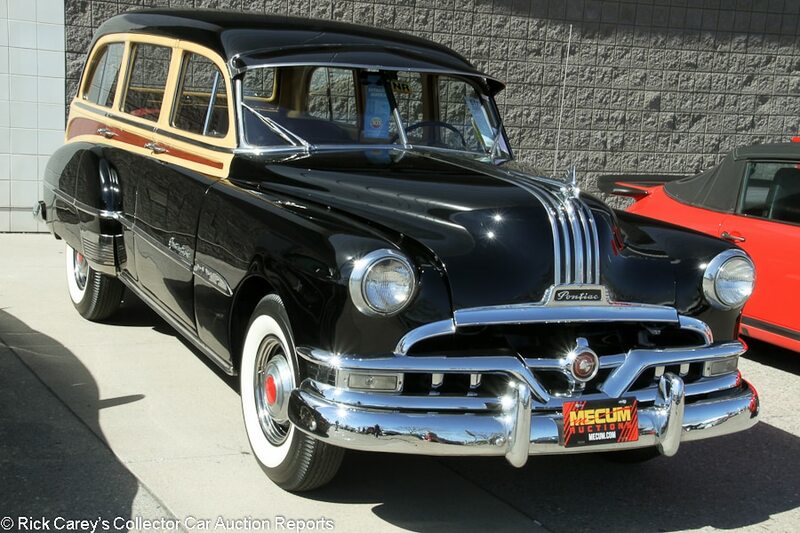 Lot # S17 1951 Pontiac Streamliner Station Wagon; S/N P8US3708; Black, Wood/Red vinyl, Beige cloth; Cosmetic restoration, 3 condition; No Reserve; Hammered Sold at $28,000 plus commission of 10.00%; Final Price $30,800 – Fake wood-pattern paint on the body, hub caps and trim rings, fender skirts, sun visor, hood ornament, three on the tree, pushbutton radio, dash clock. – A gift to Richard Petty from his wife, Lynda, for his 60th birthday. Thick repaint over old paint. Doors fit poorly. Good upholstery but remarkably bad outside woodgrain paint. Fair chrome. Original undercoat. Erratic engine compartment. Looks good at a hundred feet but the impression deteriorates quickly. – Sold for $36,300 in Kissimmee only a few months ago, with two thirds of that value going to the Richard Petty connection. The price was lower in Arizona, but it’s a similarly huge result that’s irrelevant to anyone buying or selling a Streamliner wagon with no celebrity connections. The ownership experience must have been tremendously disappointing to see it back on the market in two months and it won’t be at all surprising if the buyer here has a similar awakening and tries to flip it out of the garage in another few months. Spring Classic? 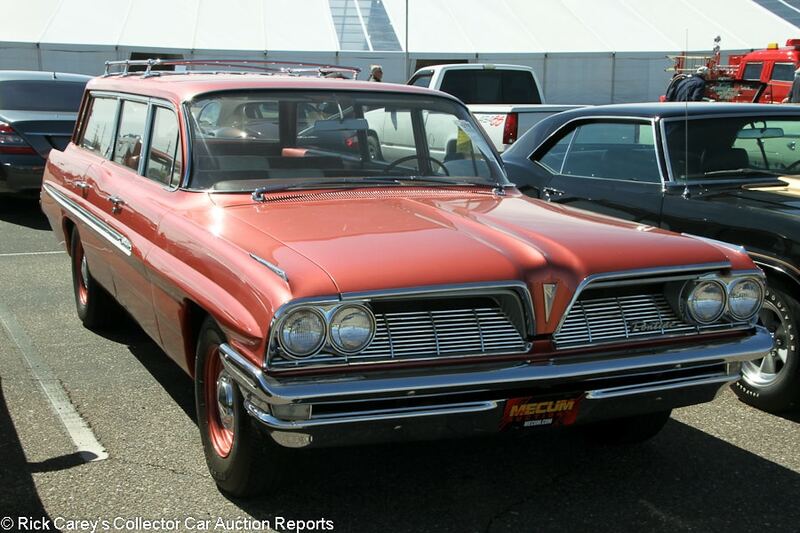 Lot # S109 1961 Pontiac Ventura Sport Coupe; S/N 561A1811; Coronado Red/Tritone vinyl; Recent restoration, 2 condition; With Reserve; Not sold at Hammer bid of $62,000 – 389/348hp Tri-Power, eight-lug wheels, narrow whitewalls, Tremec 5-speed (original 4-speed knob), power steering, power brakes, factory air conditioning, 3.42 Safe-T-Track, later Alpine stereo, bucket seats. – Small chip in the clear coat above the left headlight and another at the back of the driver’s door. Otherwise excellent paint and chrome. Very clean but not overly detailed engine bay, and the original air conditioning is both connected and working. Nearly spotless fresh underbody. Excellent restored interior. Restored to very high standards and although not exactly correct with the transmission swap and later radio, there’s hardly anything to critique. – As great as this one is and even though it’s a top-spec Tri-Power car, a ’61 Ventura isn’t worth much more than the reported high bid in any condition, and the offer should have been taken if there was money close to it. 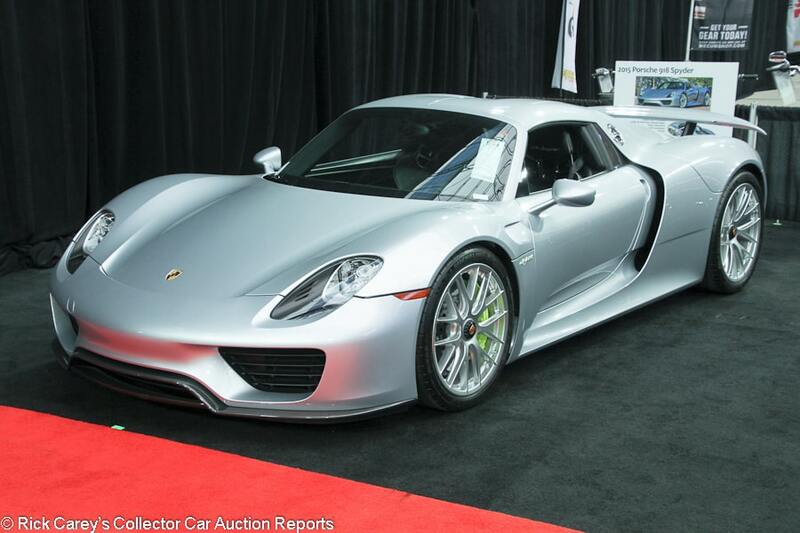 Lot # S94 2015 Porsche 918 Spyder Convertible; S/N WP0CA2A1XFS800072; Silver/Black; Unrestored original, 2 condition; With Reserve; Not sold at Hammer bid of $1,300,000 – Acid Green calipers, Burmester sound, front lift system. – One owner and 3,571 miles. Like new, as it should be. – A 3,571-mile 918 is actually on the high side, although this car has done just 63 miles since it sold for $1,430,000 at Barrett-Jackson Scottsdale last year. That sale had the same $1.3M hammer bid as here in Phoenix where it was represented as having just 63 more miles. If anything 918 prices are lower than they were in 2018, so this offer could have been taken if there was money close to it. 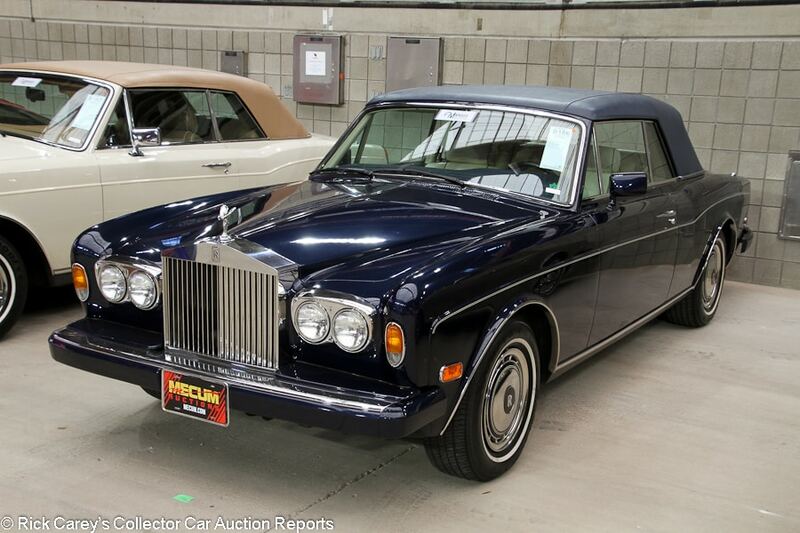 Lot # S186 1991 Rolls-Royce Corniche III Convertible; S/N SCAZD02D7MCX30513; Dark Blue/Beige leather piped in Blue; Blue top; Unrestored original, 2 condition; With Reserve; Hammered Sold at $66,000 plus commission of 10.00%; Final Price $72,600 – Wheel covers, Goodyear narrow whitewalls, climate control, Alpine stereo. – Represented as 15,318 original miles. Very good paint and brightwork. Excellent straight top. Very good interior. Nearly immaculate, babied and seldom driven from new. An ideal example. – More pedestrian Rolls-Royces of this period can carry a temptingly low price tag, but the Corniche is a different story and it has always been a far more exclusive car than its sedan cousins. The prices reflect that, and this price is about what it takes to get into a very good one like this. 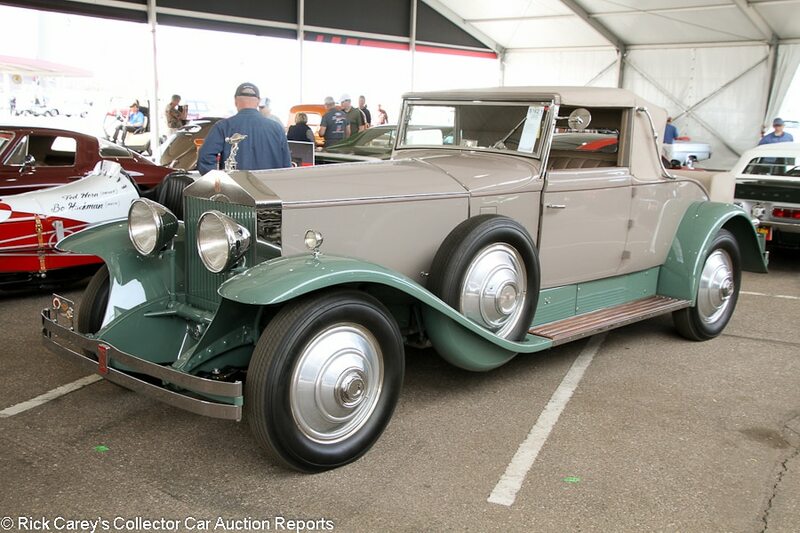 Lot # S162.1 1931 Rolls-Royce Phantom I Regent Convertible, Body by Brewster; S/N S109PR; Grey, Green fenders/Beige leather; Beige cloth top; Older restoration, 2+ condition; With Reserve; Not sold at Hammer bid of $260,000 – Disc wheels, Lester blackwall tires, dual sidemount spares, suicide doors, golf bag door, landau bars, luggage trunk with canvas cover, dash clock, wood running boards. – A gorgeous two-seater Rolls in attractive colors. Award winner at Pebble Beach, AACA and RROC Nationals. Very good paint and brightwork. Nearly spotless underneath. Mild dirt on the top. The driver’s door scrapes along one spot on the bottom, and the steering wheel is worn. A few small details probably prevent this car from taking home any more major awards, but they take little away from its presence and desirability. It’s still a stunning automobile. – Sold by Bonhams at Scottsdale last year for $236,500, then by Gooding at Scottsdale two months ago in a post-block transaction for $187,500, there is absolutely no reason in the world why it wasn’t sold at this reported high bid. Well, no reason except that maybe there wasn’t any money in the stadium. 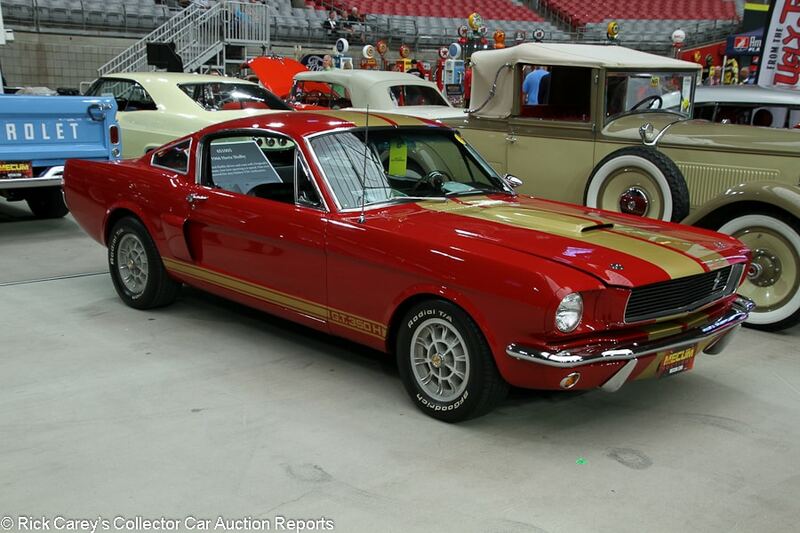 Lot # F117.1 1966 Shelby Mustang GT350H Fastback; S/N SFM6S1005; Candyapple Red, Gold stripes/Black vinyl; Recent restoration, 2 condition; With Reserve; Hammered Sold at $110,000 plus commission of 10.00%; Final Price $121,000 – 289/306hp, 4-speed (originally automatic according to the SAAC Registry), Shelby wheels, Radial T/A tires, woodrim steering wheel, factory radio, dash clock. – Rare not-black Hertz Shelby. Very good paint and chrome. Some light scratching on the glass and window frames. Very good restored interior. Clean and fully restored underneath. Not overdone, but to nearly like new standards. – Once out of the Hertz inventory many GT350Hs were quickly converted to 4-speeds and while that detracts from their purist collector value it adds immeasurably to their driving enjoyment. The Candyapple Red and Gold livery is a desirable feature that offsets some of the value knock of the 4-speed conversion and this result is appropriate in today’s market. 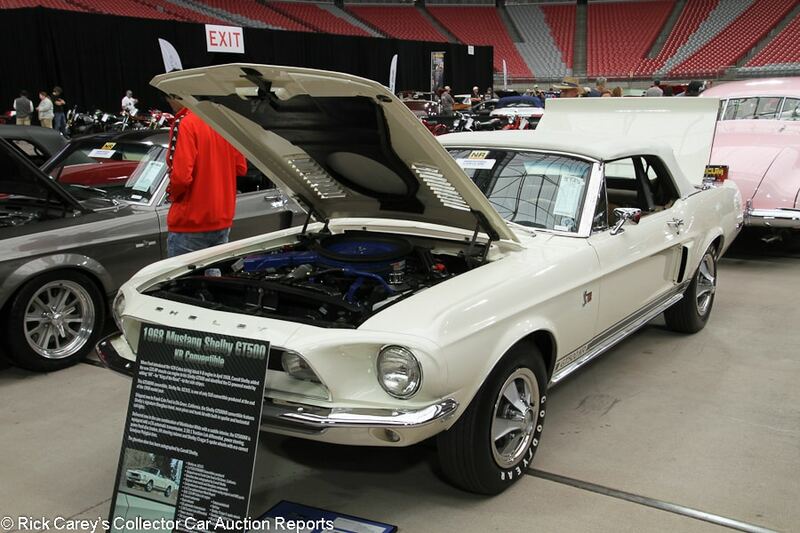 Lot # S145 1968 Shelby Mustang GT500 KR Convertible; S/N 8T03R201746-02315; Wimbledon White/Tan vinyl; White vinyl top; Older restoration, 2- condition; No Reserve; Hammered Sold at $135,000 plus commission of 10.00%; Final Price $148,500 – 428/335hp, automatic, Shelby wheels, Goodyear Speedway tires, 3.50 Traction-Lok, power steering, power brakes, tilt steering column, tinted windshield, Philco radio, console, Shelby signature on the glovebox, Marti Report. – Very clean, lightly run restored engine bay. Very good paint and chrome. Thick, gloppy glue marks around the edges of the rear fender vents. Very good interior, wrinkled and slightly dirty convertible top. An inherently desirable top-spec Shelby and it has been fully restored, but there are some issues that can’t really be ignored. – Those issues are recognized with this cautious result that makes sense and as embodied in Mecum’s pre-sale estimate range. That said, another $15-20,000 would not have been unreasonable. 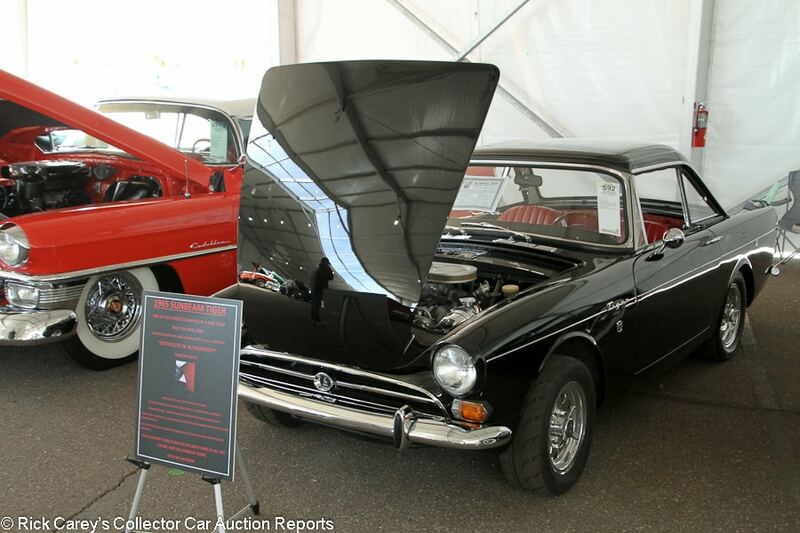 Lot # S92 1965 Sunbeam Tiger Mk I Convertible; S/N B9472278; Black/Red vinyl; Cosmetic restoration, 2- condition; With Reserve; Not sold at Hammer bid of $51,000 – Centerlock wheels, Toyo tires, hardtop and soft top, 260/164hp engine, woodrim steering wheel, dual mirrors. – A genuine Tiger authenticated by STOA, but not represented as matching numbers. Good paint and chrome. The engine bay is tidy but a bit dirty. There’s some various wiring and other bits that are original, so it wasn’t fully restored. The windshield is delaminating around the edges. Mostly good interior with some light wear on the shifter and steering wheel. Light restoration work underneath. Rare, attractive colors and good equipment, but restored on a budget. A solid Tiger in good weekend driver condition. – The reported high bid was a lowball offer for anything but a bad Tiger, and this is not a bad Tiger. It deserves at least another 15 or 20 grand. 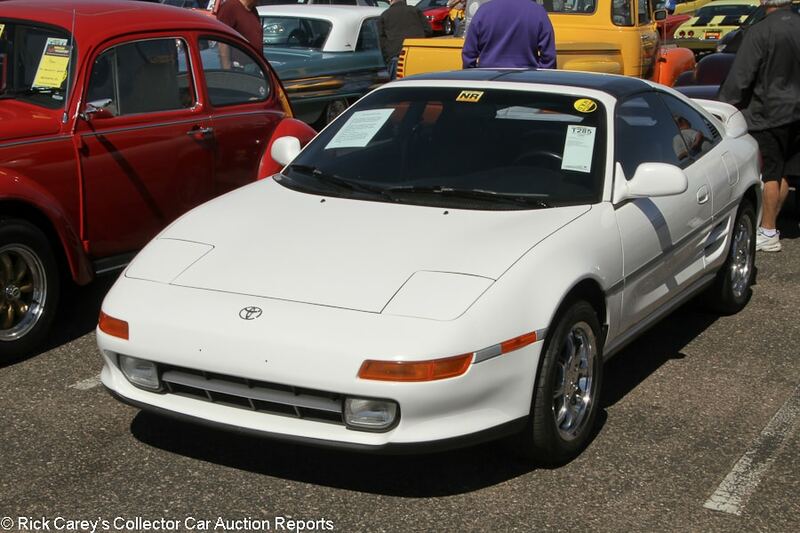 Lot # T285 1991 Toyota MR2 Turbo Coupe; S/N JT2SW22N6M0017928; White/Gray leather; Unrestored original, 2- condition; No Reserve; Hammered Sold at $12,000 plus commission of 10.00%; Final Price $13,200 – 2 liter/218hp turbo, 5-speed, chromed aftermarket wheels, Falken tires, CD stereo, T-tops. – Showing 46,487 miles and represented with a major service 500 miles ago. Light scrapes on the underside of the chin spoiler. Good original paint and interior wear that corresponds with the mileage. A well-kept and attractive MR2 Turbo, seemingly all stock except for those ugly wheels. – Often referred to as a baby Ferrari, the Toyota MR2 has long offered the mid-engine sports car experience on a budget, and the turbocharged second generation models actually offer ample power to go with the sharp handling. Prices for good unmodified ones like this are on the way up but are still reasonable. Other than the boring color and aftermarket wheels, this is a great example and it brought an appropriate price. 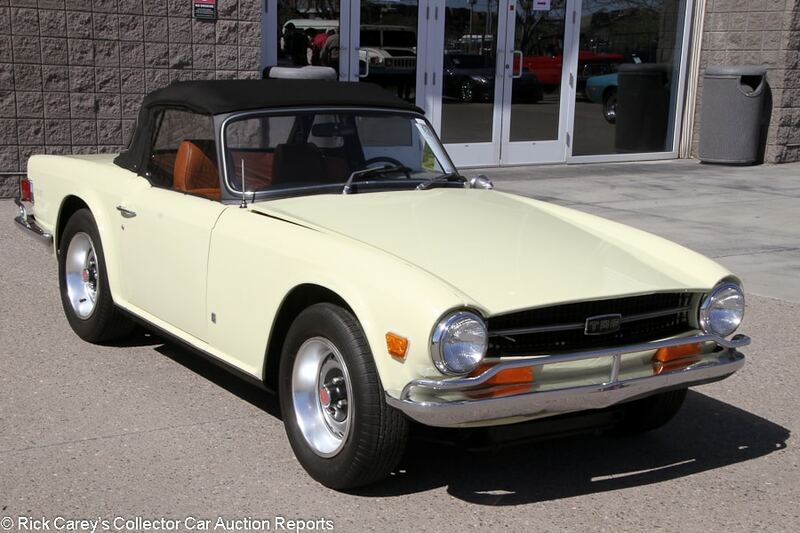 Lot # S12 1972 Triumph TR6 Convertible; S/N CC79441U; Light Yellow/Tan vinyl; Black cloth top; Enthusiast restoration, 2- condition; With Reserve; Hammered Sold at $13,000 plus commission of 10.00%; Final Price $14,300 – 2498/106hp, 4-speed, factory wheels, Yokohama tires, leather-wrapped steering wheel, Pioneer cassette stereo. – Tidy, partially restored engine bay and there is other restoration work underneath but never taken fully apart. Good older paint with touch ups here and there. Sound original chrome, but it’s showing its age. Very good interior with newer seats, clean wood and clear gauges. Not a show car, but an attractively restored slim bumper TR6 in one of the very best color combinations. – This car isn’t any worse and is arguably better than the red ’72 TR6 that got bid to $20,000 and the orange ’76 that sold for $21,450. Both those cars crossed the block on Thursday, however, so maybe by Saturday all the Triumph folks had gone home. Sold early in the day, this one flew under the radar a bit. It deserved a few more bids, but the seller fairly decided to let it go and the new owner has a lot of car and style for the money.